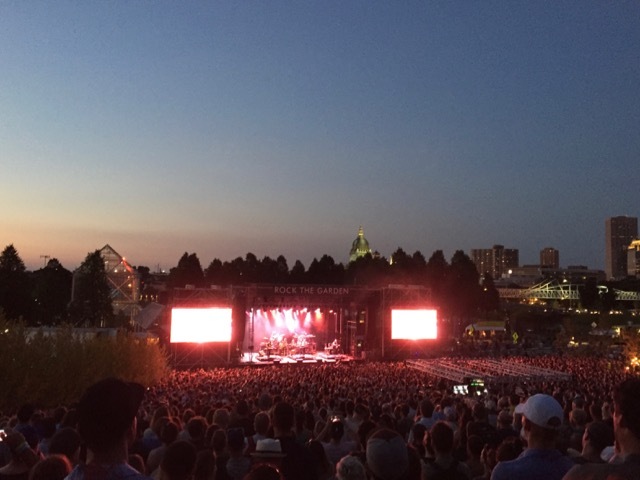 I finally got a chance to see one of my favorite bands live a few weeks ago—Bon Iver played an incredible set on a beautiful evening at the Walker Art Center. It took me a long time to warm up to the newest album; but it’s now indelibly in my heart along with the first two. So as I’m reading awful news headlines, or working in my August garden, I sometimes find that first track running through my head—It Might Be Over Soon. But not necessarily in a bad way, I guess? Everything has a season. 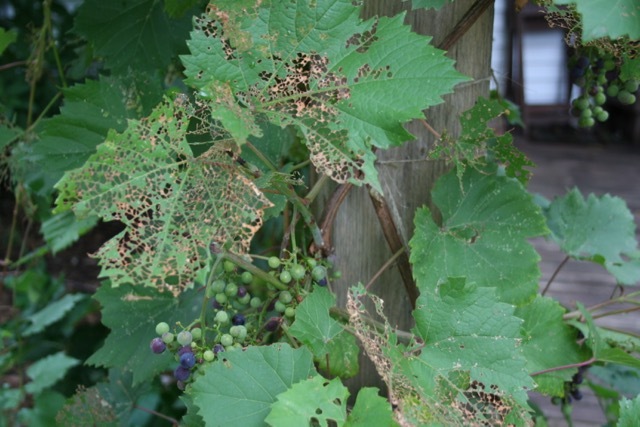 Even Japanese beetles have a season, and it will be over soon. 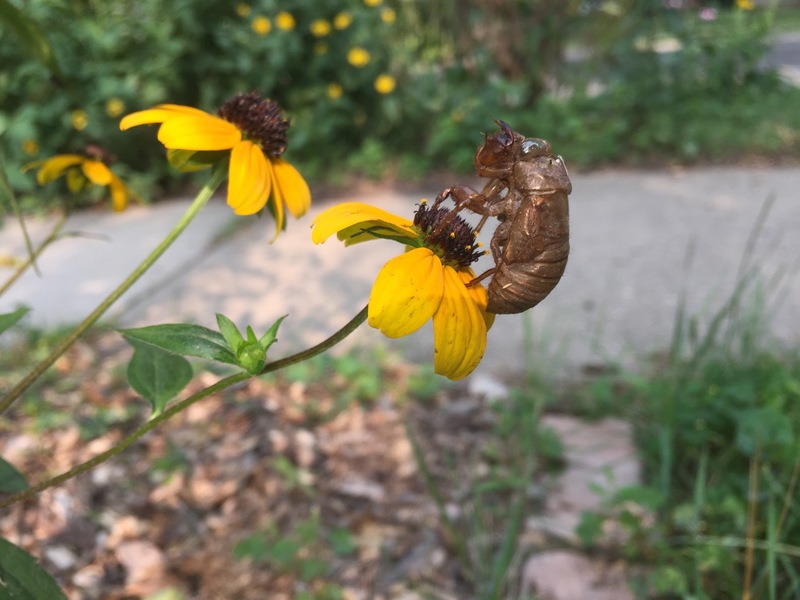 Apparently I’m not the only one suffering—our cool (but not cold), wet spring meant a bumper crop of beetles for Minnesotans. 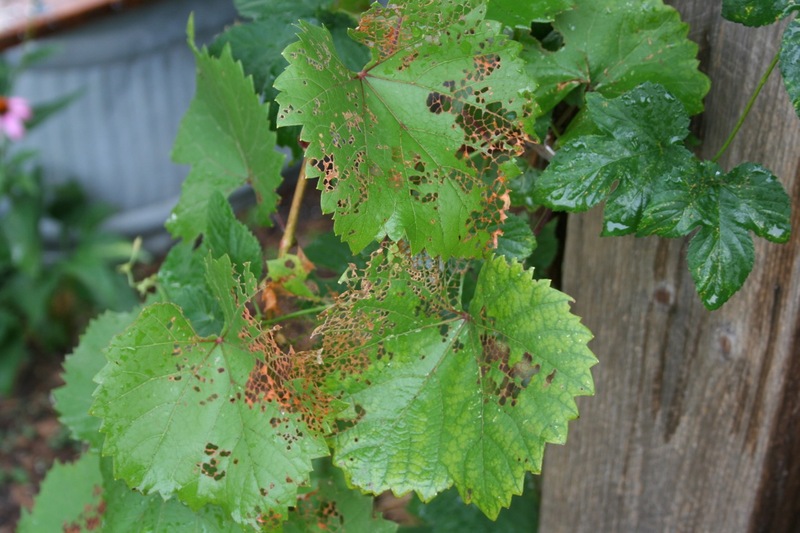 So, if you have foliage that looks like my poor grapevine above, there’s a good chance you have these bugs (look on the under side the leaf). My whole family has been hunting them every morning and evening. 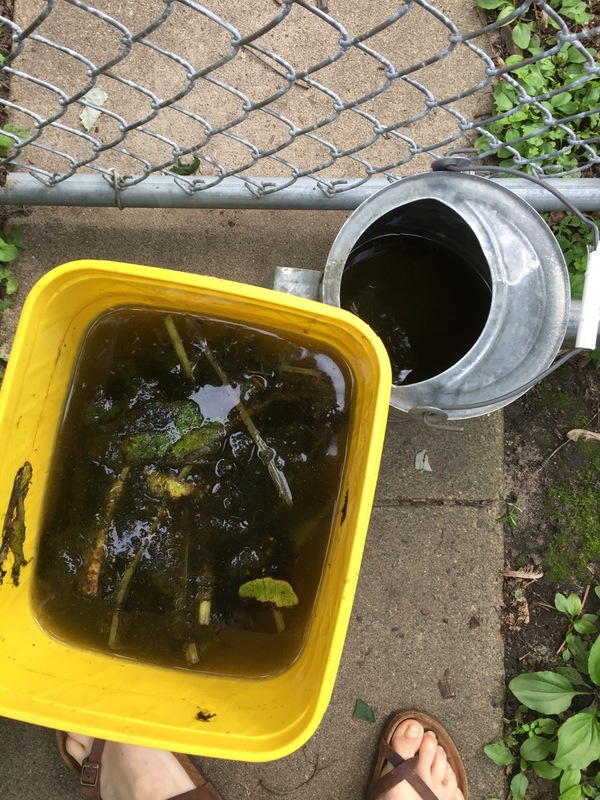 We simply carry around little containers of soapy water and brush them off the leaf and into the water. It’s not hard or even gross; they die pretty quickly. Here you have a collection of dead Japanese beetles along with two of the last grapevine beetles. Our grapevines had a hard year. 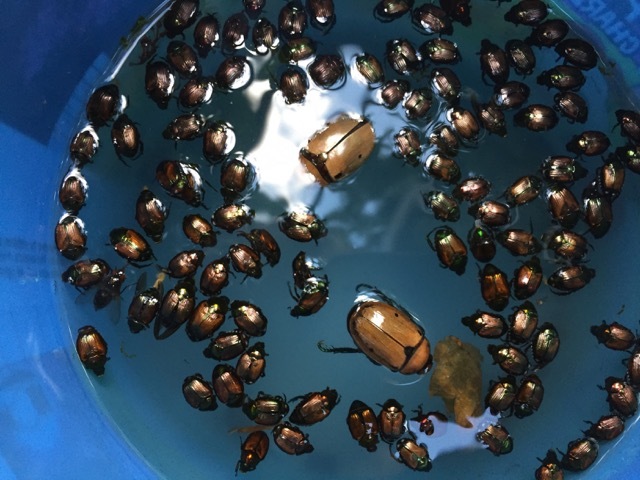 Please, if you see Japanese beetles try and get over the gross out factor and TAKE THEM OUT. You will thank yourself next year. My tomatoes were a bit late this year—partially because I grew only large ones. I didn’t harvest my first until July 29 or 30. Depending on when we get our first frost, this is going to be a very short tomato season. But they’re coming so fast now that I made a big batch of sauce to use them up—I use a recipe from Trout Caviar’s excellent cookbook for oven-roasted tomatoes, then I just blend them up with the immersion blender and freeze in half-pints. This becomes pizza or pasta sauce base in the winter. The reason for my big tomato harvest: my squirrel proof tomato fortress, installed in May. This thing is wonderful. 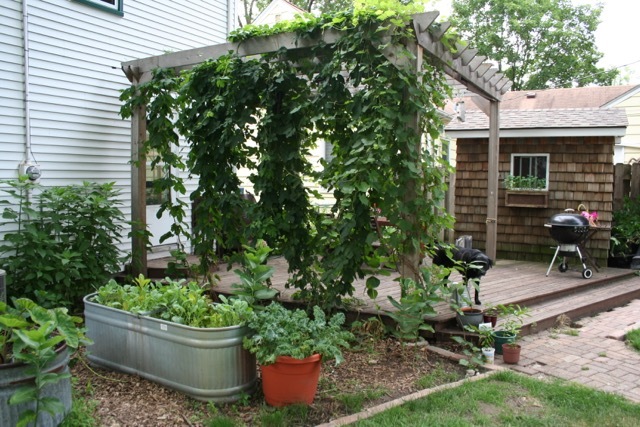 When Adam built it, we had a small debate over whether to make something just for the tomatoes or whether to make something bigger for the entire garden, and I am not sure we chose correctly. I have beautiful cucumber vines climbing the trellis just to the left of the tomato cage, and I have harvested precisely 2 tiny cucumbers from it—squirrels have eaten nearly 100% of my cucumber harvest. 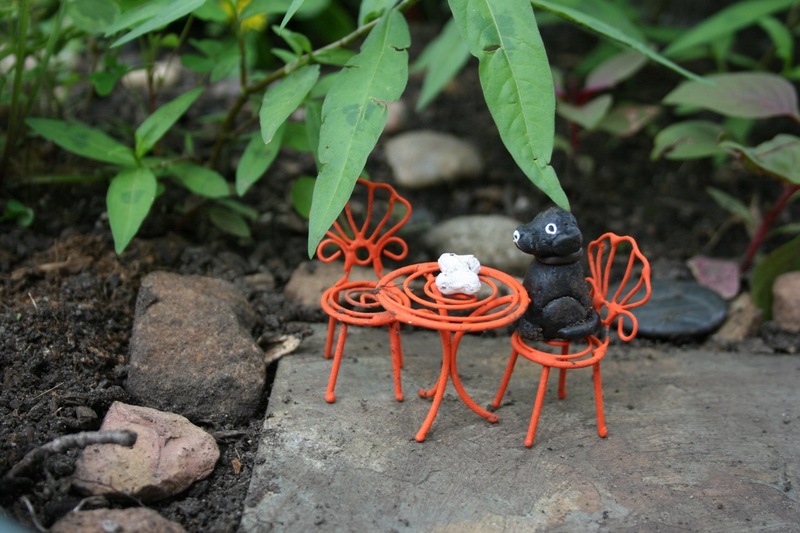 I have some leftover chicken wire and I’m going to see what I can do with it this afternoon. Summer vacation for my teacher husband and kids will also be over soon. 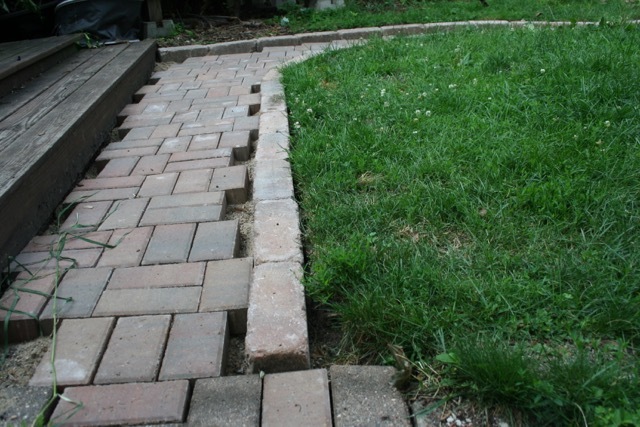 Adam’s been very productive; he’s almost finished with a massive landscaping project of brick paths all over the yard. Walking out to the garden in my slippers can now legitimately be a thing. He also made this raised strawberry bed. 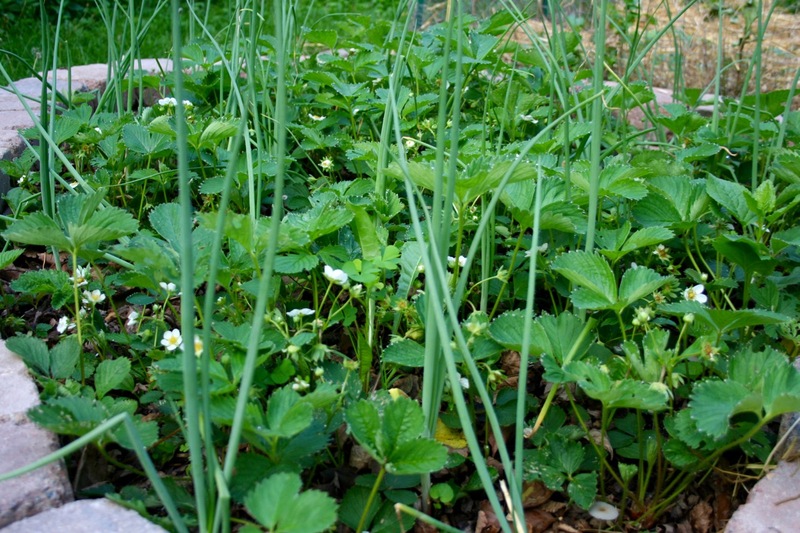 Our strawberries were overrun with weeds, and the size and shape of the bed made it annoyingly difficult to maintain. 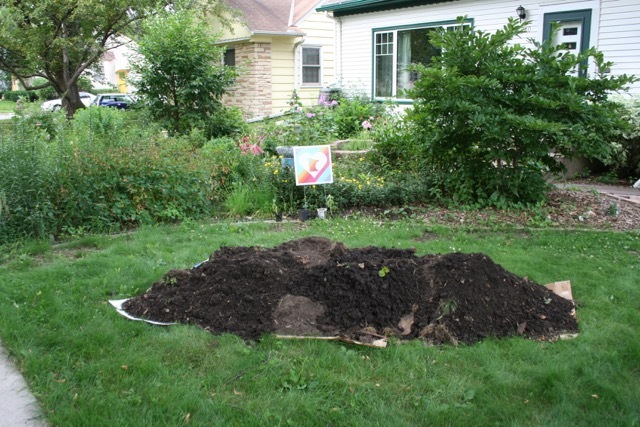 We carefully dug up the strawberry plants, built this, filled the bottom half with compost, then added soil and replanted the strawberries. 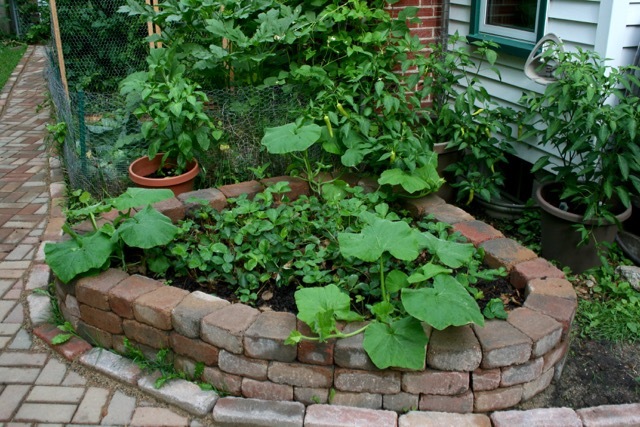 A week or two later we had pumpkins sprouting, from the compost. I decided to let three of them grow, just to see what happens. If we have a late frost I could end up getting a pumpkin or two! Here’s another angle. I love all the curved intersections on these paths. This view hints as to what he has in the works for 2018: a gate! He’s going to complete this path to the door of my garden shed, then replace this chain link fence with a wood fence and gate. 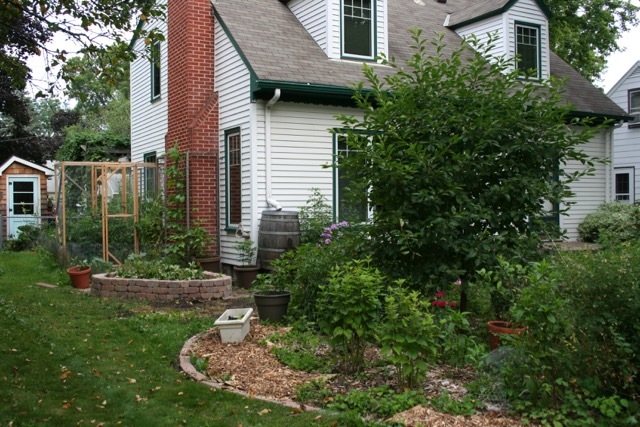 The garden will be 10 steps from the kitchen instead of 60. I may never walk around the north end of my house again. He is also going to add a few arches at certain intersections, based on what I found in my friend Marianna’s garden. Arches give such a nice effect. 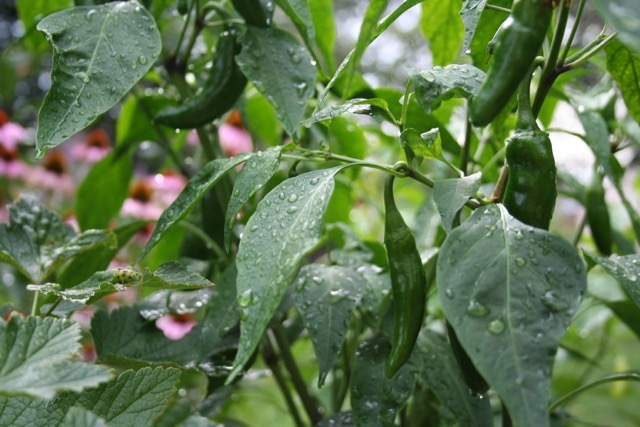 My peppers also got going a little late and are now making up for it with great quantities. Trying to pickle as many as I can, but everyone’s eating them as fast as I pickle them. I’m also drying some herbs. Of course basil (right) and parsley (middle left) are not as good dried as fresh, but I have tons and they’ll just go to waste otherwise. 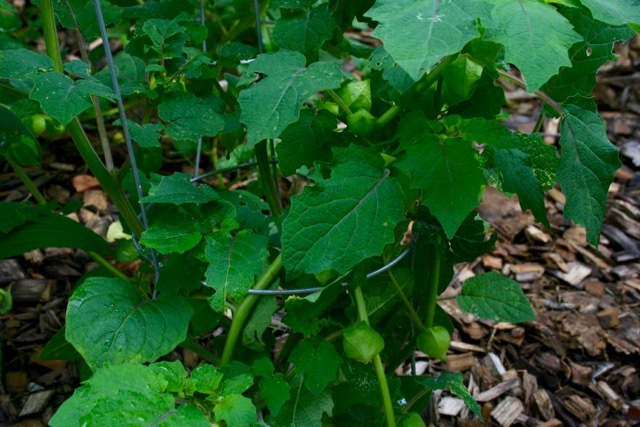 I should get a few ground cherries for the first time this year, but less than I hoped for because the spot is shadier than I first realized when I planted them early this spring. 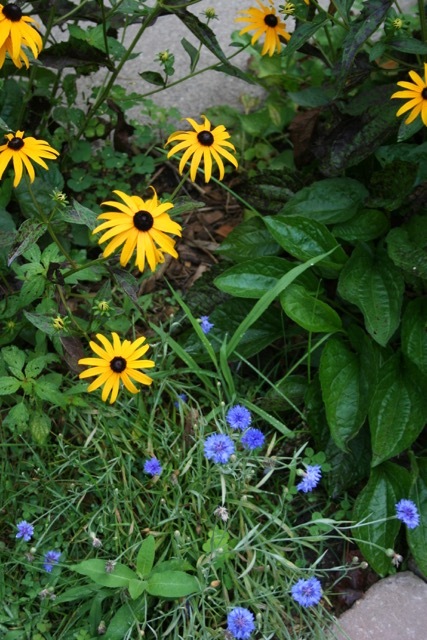 I love the contrast that these blue bachelors’ buttons give to my brown-eyed susans. They were some orphan plants that I got for free and just planted very randomly with little thought, so what a happy surprise that they’re thriving. Hopefully they’ll reseed and come back next year. Over in the boulevard, several of these suddenly popped up last year out of nowhere. I suspect their seeds were in some purchased wood mulch. Last year I thought they were weeds and just pulled them all—they do look a bit like creeping bellflower. After I pulled them I figured it out. 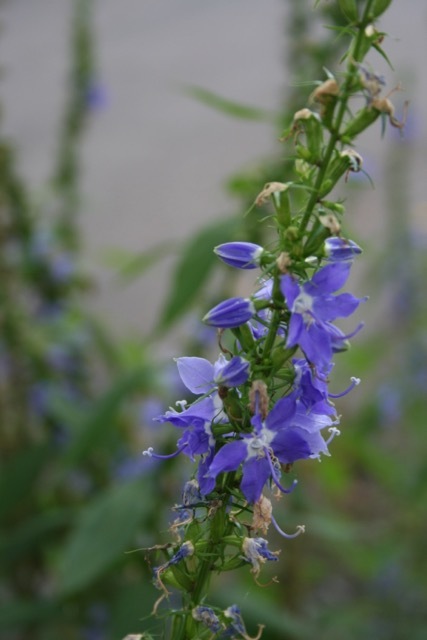 They’re in the same family—Campanulaceae (Bellflower) but these are American Bellflower, Campanula Americana, a native! And they seem to be just as, erm, vigorous as their invasive cousin—they came back readily this year despite my pulling nearly all of them last year. I’m keeping an eye on them for now. 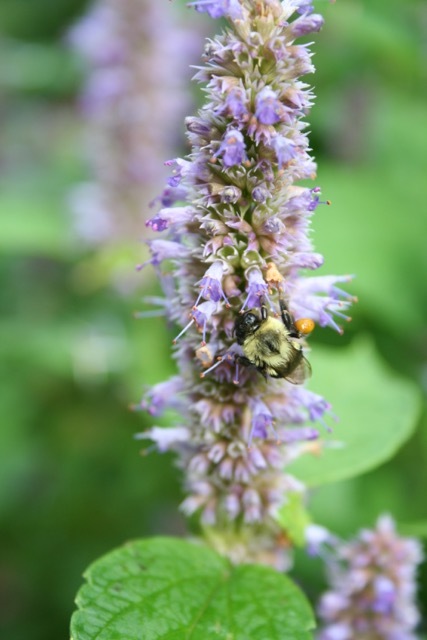 Here’s a bumble on my anise hyssop. 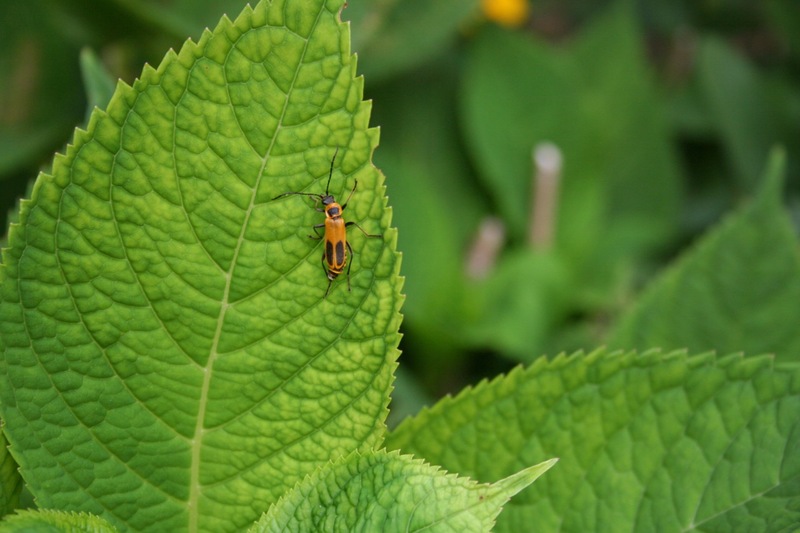 For several years I had a wonderful anise hyssop patch in the back yard, and suddenly early this spring they all got eaten to the ground by some bug. I moved in some volunteers from elsewhere in the yard, and those got eaten too. So I dug up even more volunteers (are you sensing a theme with anise hyssop?) from my community garden plot and added them in a completely different area of the yard, and they’re doing fine. I’m going to wait another year or two before planting them again in the back. 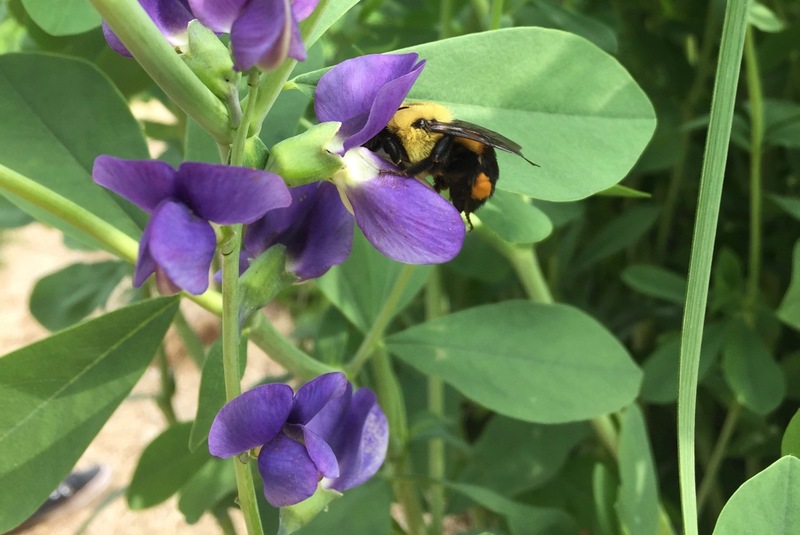 Fortunately they’re very versatile in their soil and light requirements—and they are absolutely covered with bees right now. I also dry these leaves/flowers for tea. That was three blue or purple flowers in a row, but the reality is the majority of my flowers are yellow this time of year. 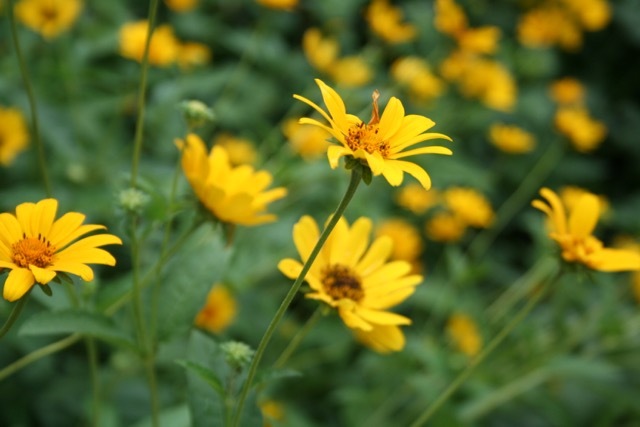 These early sunflowers are VERY vigorous and are taking over much of my prairie boulevard. Summer might be over soon, so it’s time to get out there and enjoy it while we can. 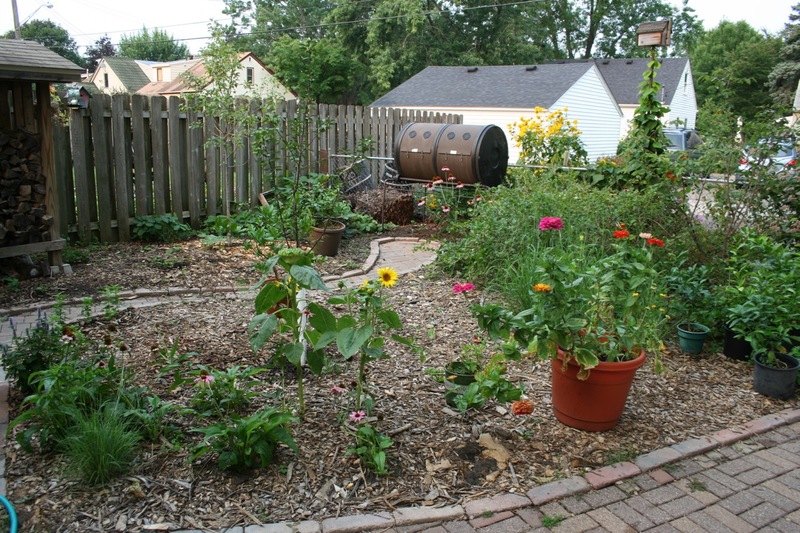 Categories: Gardening, Permaculture, Practical | Tags: edible landscaping, native plants, Permaculture, tomatoes | Permalink. 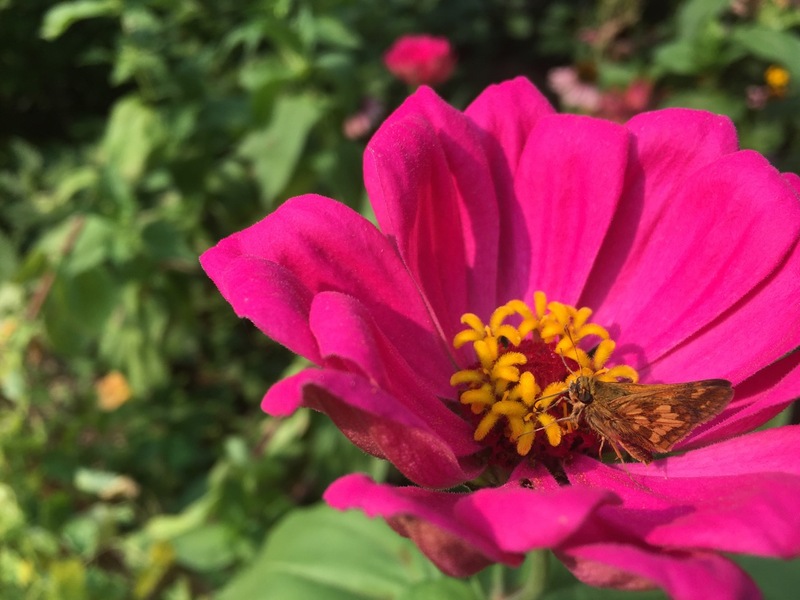 He’s edging all of our primary flower, fruit, and vegetable gardens and putting in pretty brick paths to tie everything together. He’s going to rent a wet saw this week for all the half-bricks that he needs here. 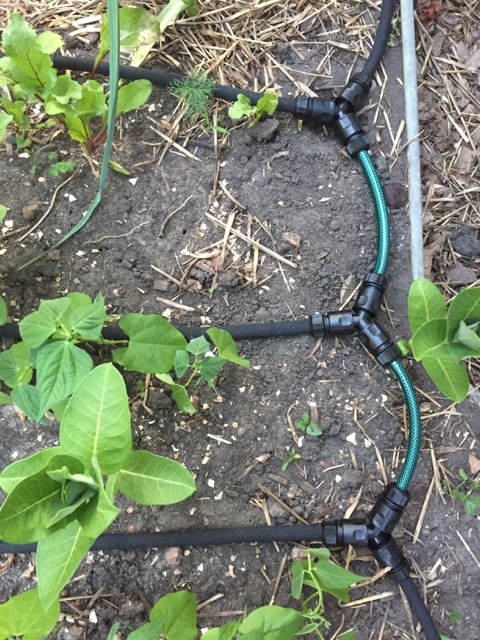 Another new thing I’m trying this year: I purchased a “Snip N Drip” soaker hose system for the main vegetable garden, because my old soaker hoses basically fell apart (they lasted 10+ years so that’s not too bad). So far, so good except for one factor: there is not nearly enough pressure from the rain barrel to be able to use it with this system. So when I need to water the garden I’m using tap water. 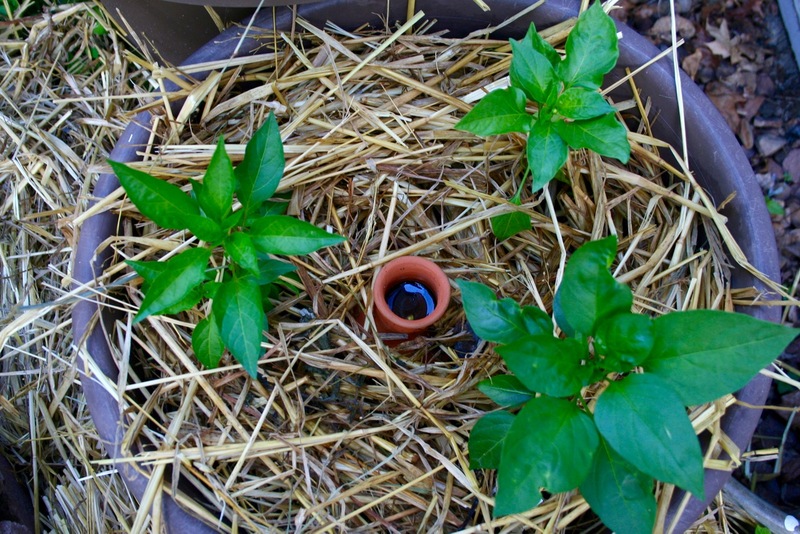 The rain barrel water is hardly going to waste though; I’m using it on my fruit trees and bushes. 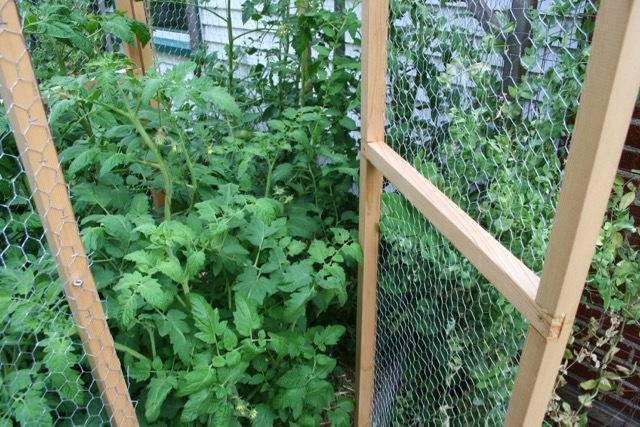 My new squirrel-proof tomato cage is great. The plants are suckering a little more than usual because it’s not super easy to get in there and prune them, but I’m fine with it. I cannot wait for fresh tomatoes! I think we’ll get a wine grape harvest this year, for the first time! These are Marquette grapes, a University of Minnesota hybrid. I’m not growing these in a 100% conventional way. If I were farming grapes with “maximum harvest” as my only goal, I’d grow them more like this. 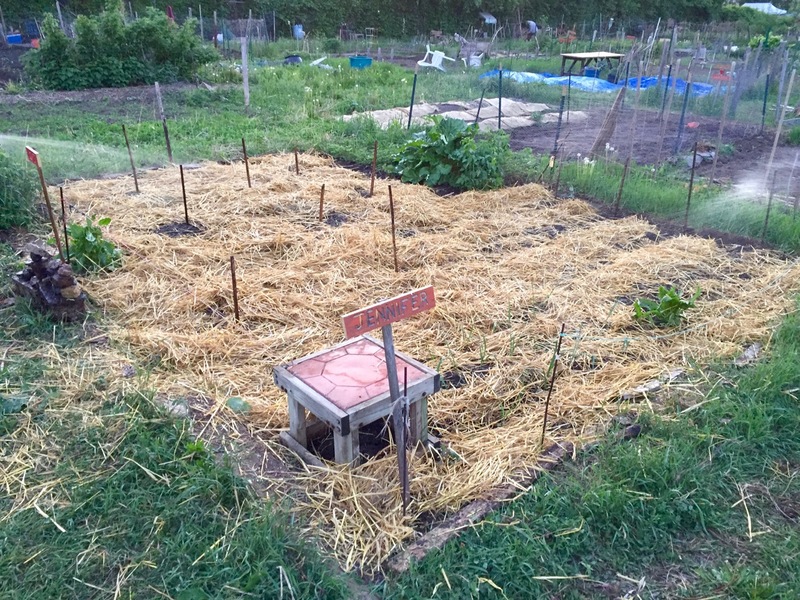 But since this is my home garden, I’m trying to accomplish several things here—I’m stacking up functions of plants and structures, to put it in permaculture words. 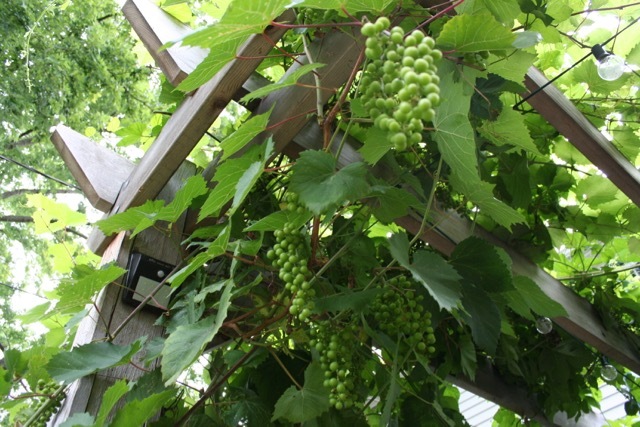 So these grapevines also provide shade and beauty in the yard in addition to fruit. I’m just crossing my fingers that squirrels won’t eat all the grapes before I get to them. Here’s a view of the arbor from further away. The grape is on the right nearest corner, in the middle on both sides are hops (climbing up twine). We got a nice hops harvest last year. 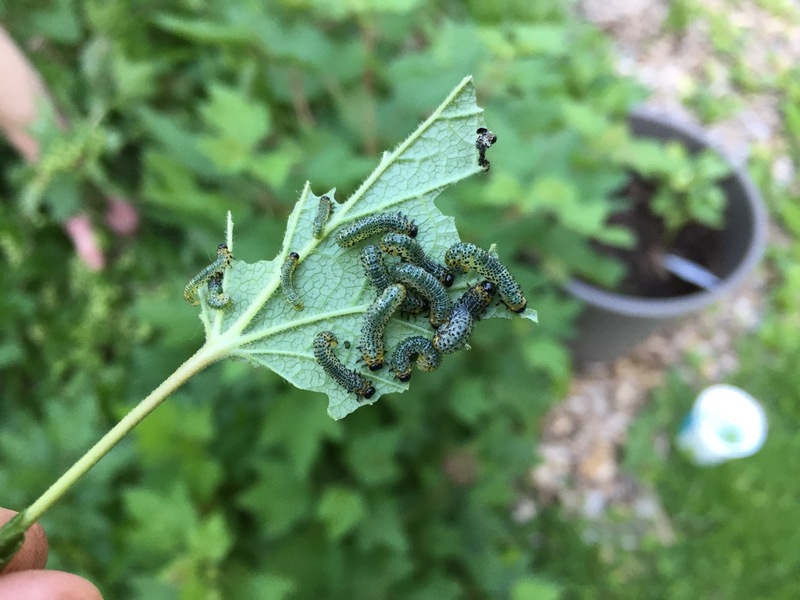 We had a minor infestation of currant/gooseberry sawflies in May but an hour or two of hand-picking took care of it, and they haven’t been back. There is supposed to be a second generation of them in June or July but I’ve never seen one. My [somewhat educated] guess is that this is due to the high number of wasps, ladybugs, and other predators that fill my yard by mid-June. 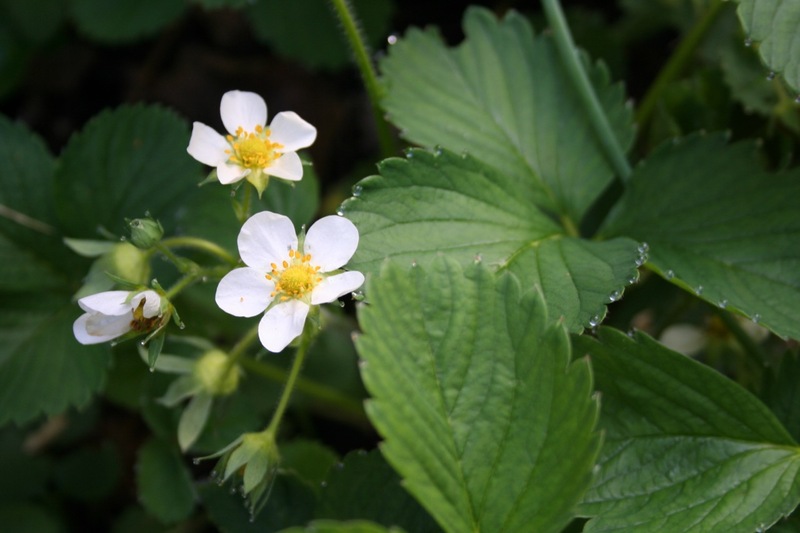 Having lots of wildflowers surrounding my fruits creates a healthier ecosystem and less work for me. 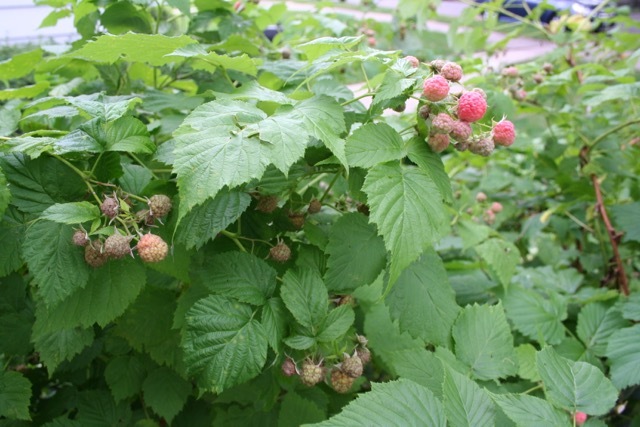 It’s almost raspberry season, hurray! The kids have already eaten a handful of them. 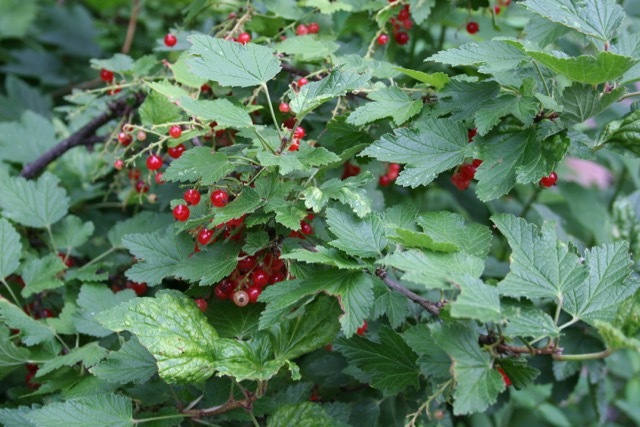 My original red currant bush is now at least 8 years old. I’m not really sure when I planted it. The bush doesn’t look so great anymore. I gave it a good pruning this spring and now it looks worse (yet it’s still fruiting like crazy). 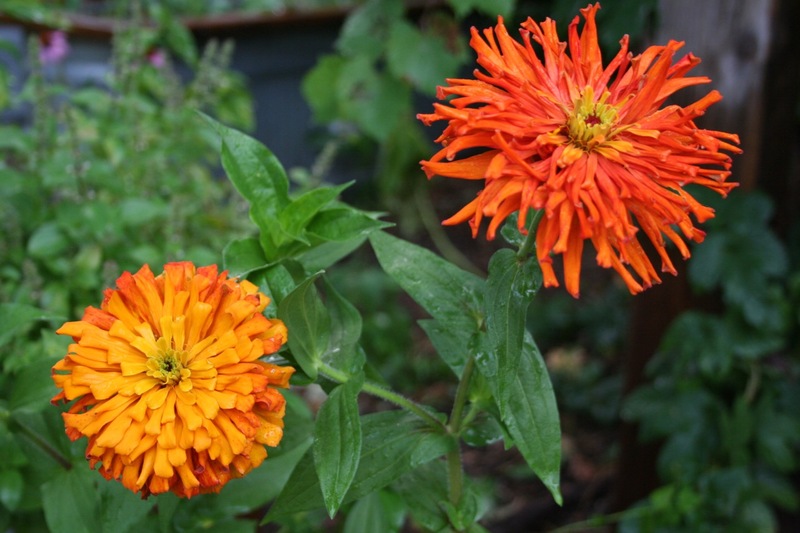 I am strongly considering doing a “renewal pruning” and just cutting it to the ground next spring, so it can get a fresh start. 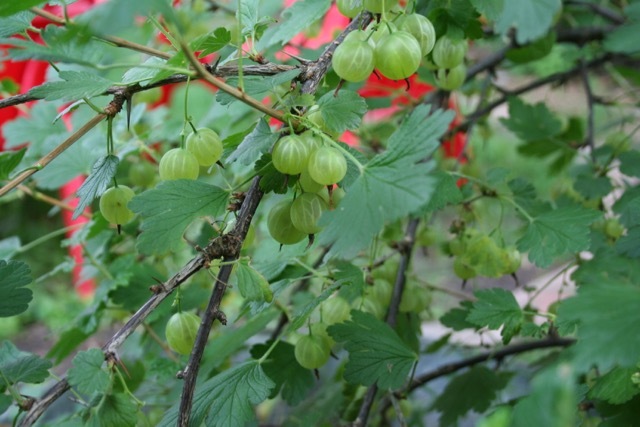 We added a second red currant bush two years ago, so we’d still get a small harvest. Our front yard cherry tree garden is filling in nicely, now in its third or fourth year. (I’m losing track of time.) The maximum size of this tree was supposed to be 10-15 feet and it’s already at least 10 feet and not showing any signs of slowing down. We finally had a large enough cherry harvest this year for a pie AND some delicious sour cherry muffins. 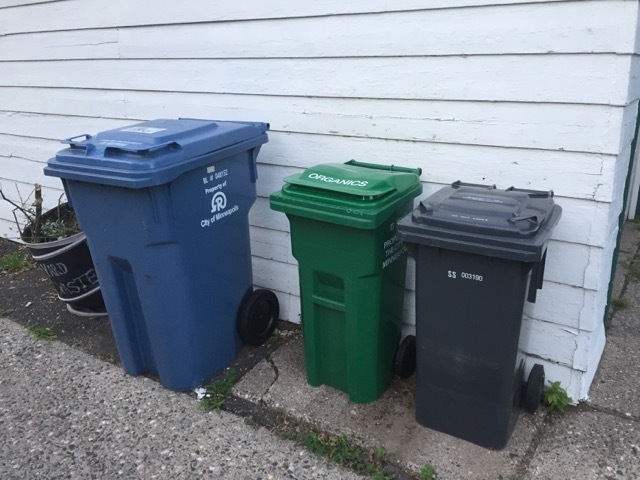 When I saw just how small the new garbage cart was, I got a little nervous. But we’re now several weeks in and it hasn’t gotten filled to overflowing even one time, despite Adam having some construction waste from his various projects. 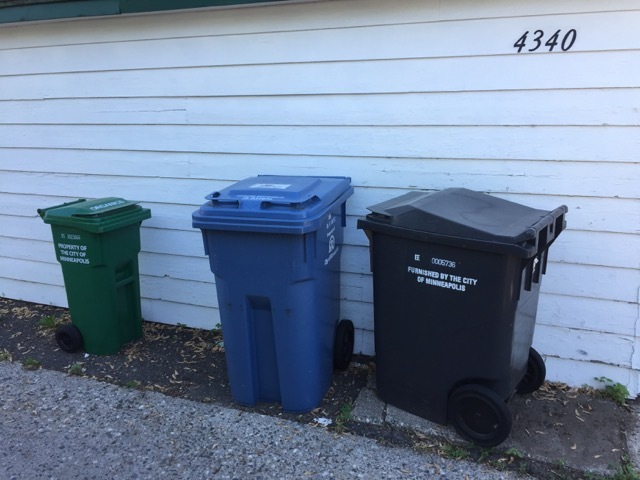 My only gripe about it is this: this garbage can is less than half the size of the previous one, but the discount per month is only $5. Doesn’t…quite…compute. But I do understand that a huge part of the cost of garbage removal is operating the trucks and paying the humans, so I will [try not to] complain. All of this edging and path-making has left us with a very large pile of sod and soil. Instead of getting rid of it, I had a brainstorm: why not make a berm!? 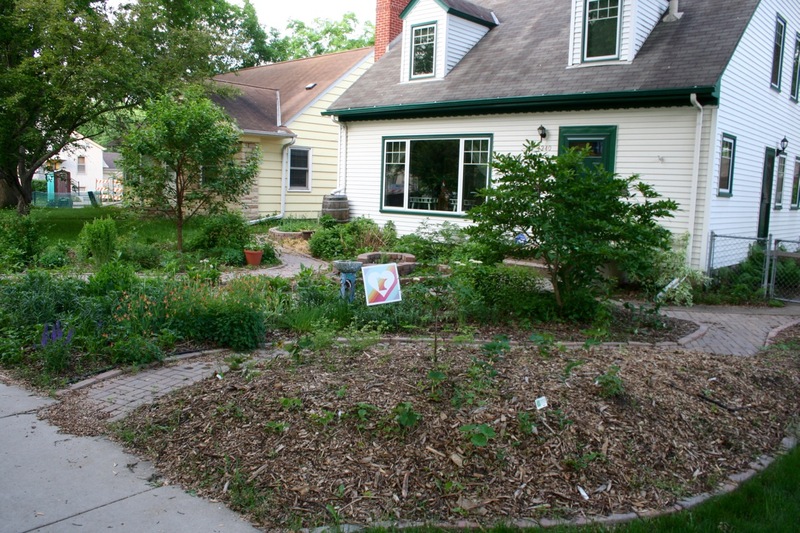 So… we’re making a berm garden in the front, under the shade of a large elm. Since it will become such a major focal point in the front yard, I want it to be very pretty but still use all native plants. 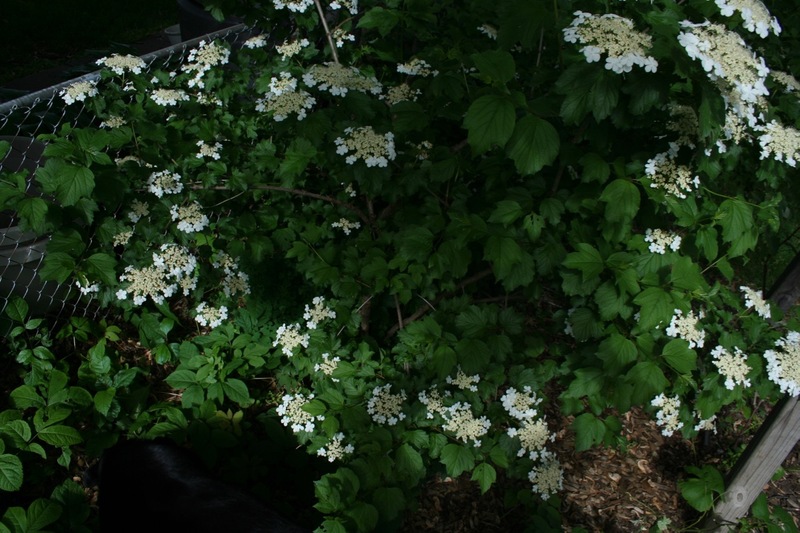 I think the biggest plant will be a pagoda dogwood. 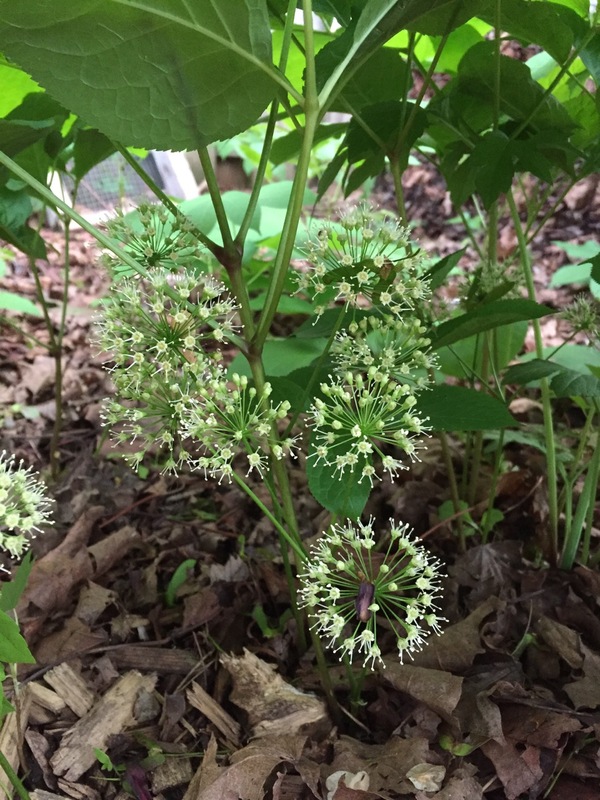 I’ll surround it with pretty woodland plants like solomon’s seal, bloodroot, and wild ginger. Look, I’m not a purist. 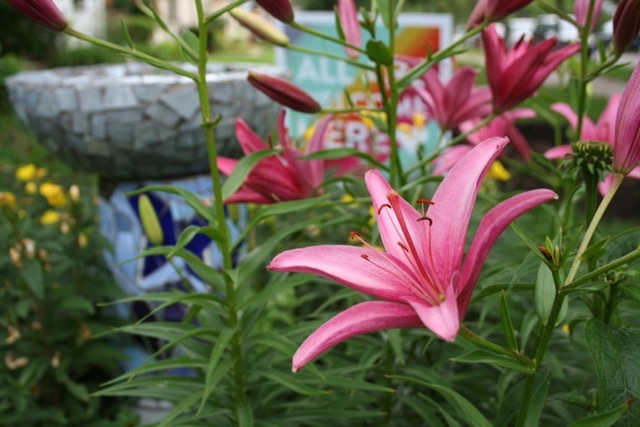 Eleven years ago when we first bought this house, I was not yet turned on to native plants and I planted these beautiful Asiatic lilies. 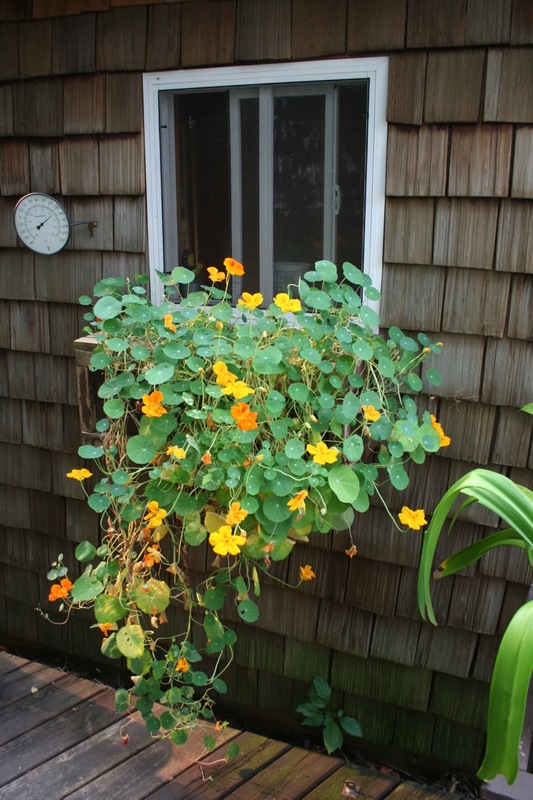 If they ever die, I’ll definitely replace them with natives, but for now… they are very pretty, yes? I hope you have a peaceful Fourth of July. 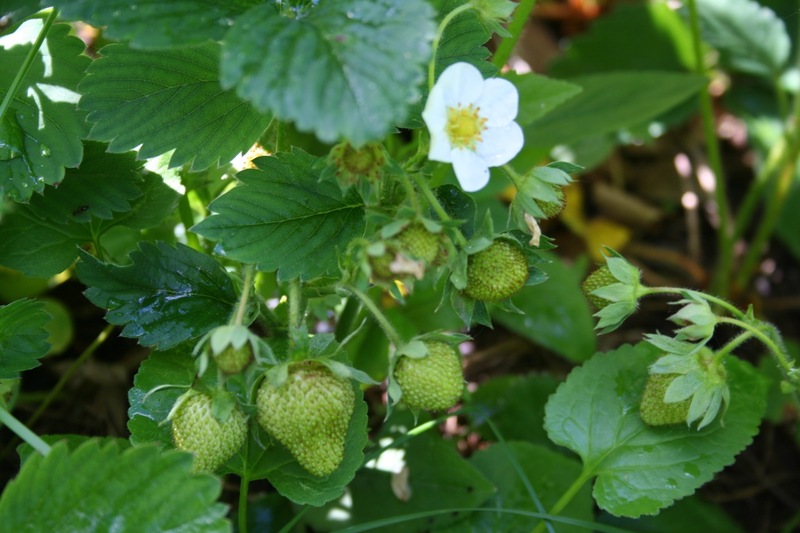 Categories: Gardening, Permaculture, Practical, Sustainability | Tags: companion planting, edible landscaping, landscaping, native plants, parsnips, Permaculture, raspberries, tomatoes | Permalink. 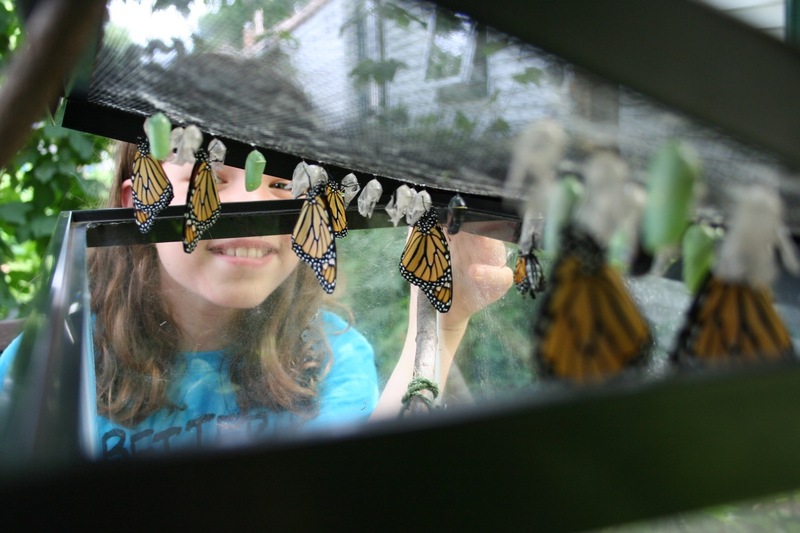 Spring is finally underway, after an abundance of cold and wet weather. 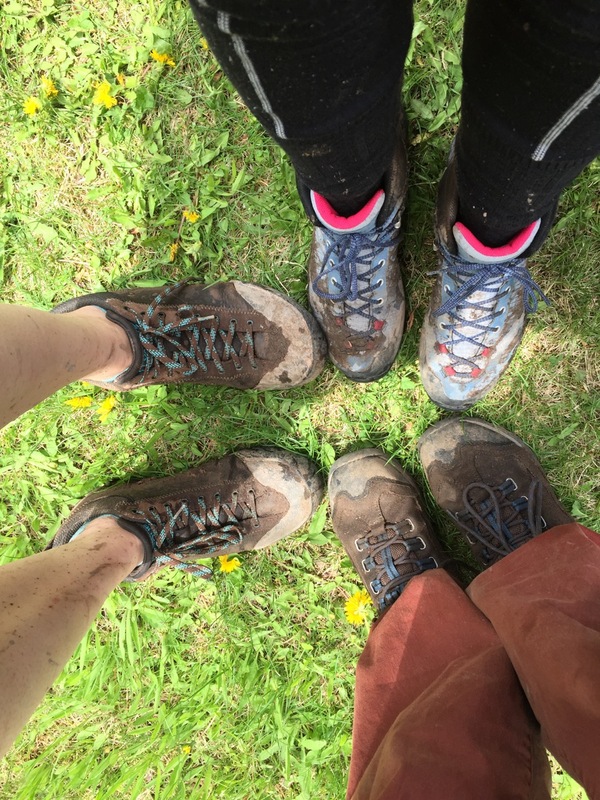 From a phenology perspective, we’re all over the place. Some things are 2+ weeks later than last year; other things are early. 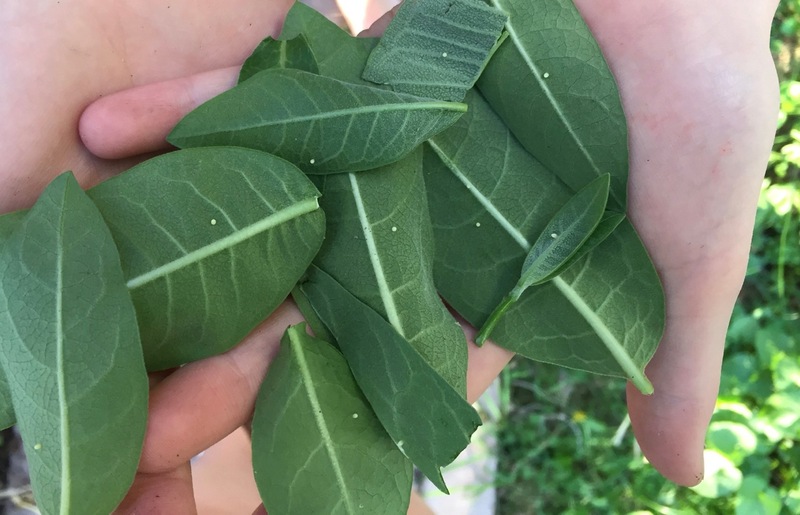 We’ve already got 20 monarch caterpillars in our living room—Anneke spotted eggs on the milkweed leaves from 6 feet away! 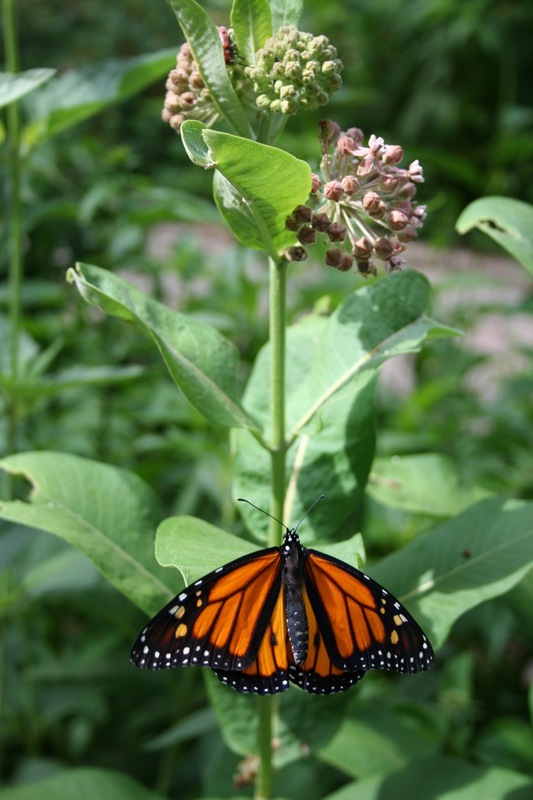 This is the earliest I’ve ever found monarch eggs. 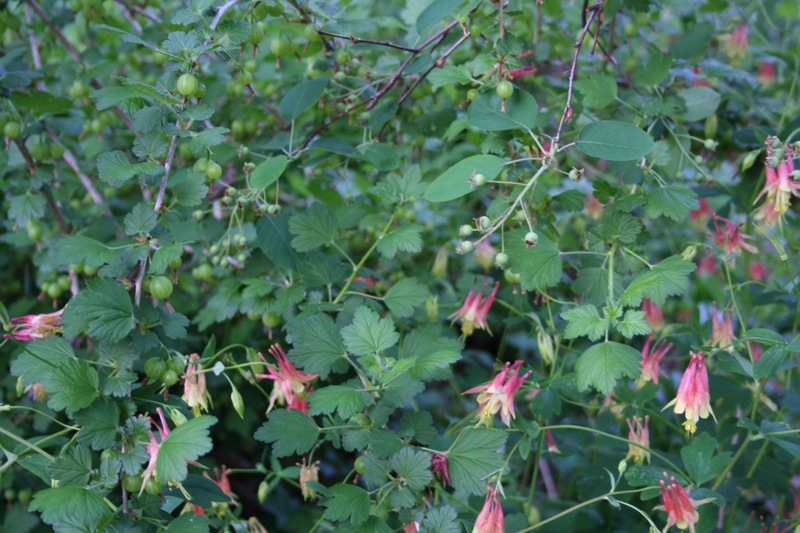 My American Highbush Cranberries are looking great—their blooms are so unique. They have really taken off recently, and are now about 7 feet tall. I appreciate a shrub that can thrive and look this great in the dry shade under a mature silver maple tree. Our understory layer is coming along. My raspberries (left), on the other hand, are looking less lush than they have in previous years. In talking with a fellow master gardener about it yesterday, I realized that I haven’t fed them in at least 2 years. I picked up a bag of blood meal and sprinkled it on the ground at their feet, then watered it in; I’ll also add some compost in the next week or two. I’ve not always given these the best of care, but they are forgiving plants and keep on going. Hopefully the blood meal will perk them up and we’ll still have a good harvest. 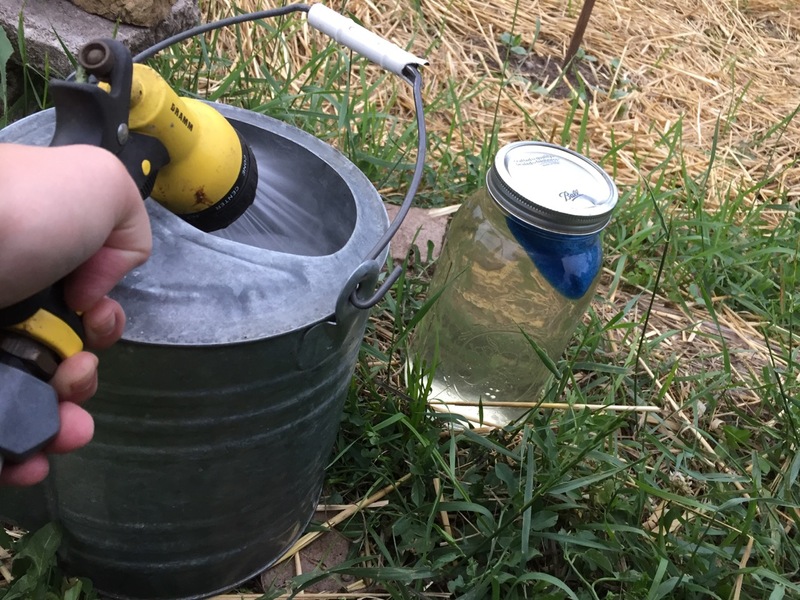 Here’s something new I’m trying: two very small blueberry bushes in a half barrel. 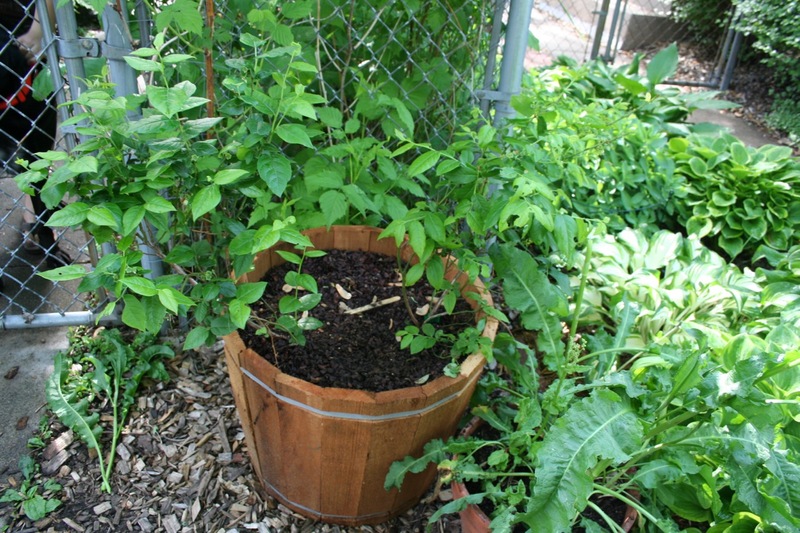 My soil is not right for blueberries, so by growing them in a barrel I have more control over soil composition. I mixed half potting soil, half peat moss for this and so far they are thriving. They’re in a pretty shady spot so they may not ever get really big, but that’s fine. Over on my currant and gooseberry bushes, we’re fighting another sawfly invasion. I pulled hundreds off today; we pulled nearly that many off a few evenings ago. If I can stay on top of them we should still be able to salvage a great berry harvest. 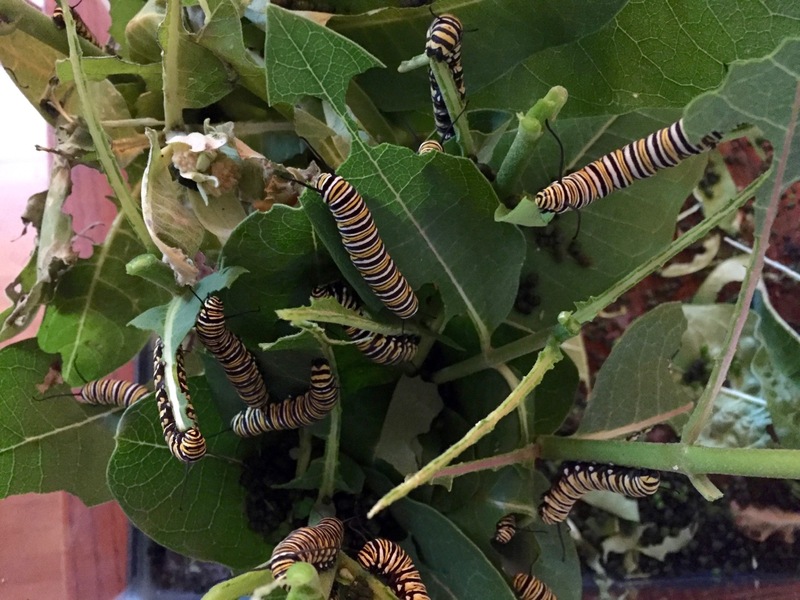 I pull the caterpillars off and drop them into a container of soapy water, which is my general method for all garden pests that I deal with. The “EW” factor is high with these guys. I am happy to report that FINALLY, I have had a successful radish year. I’ve not had the greatest of luck with them, for several years now. This year I planted them around April 12—a few weeks earlier than usual. 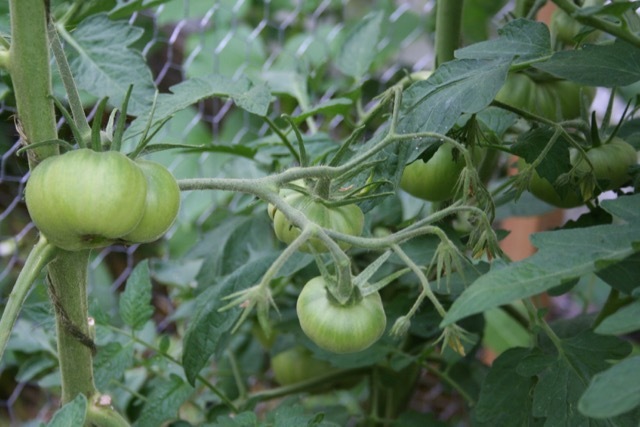 My thinking was that I could put them where I intended to grow tomatoes and eggplant, and that the radishes would be done by the time I could plant those warm season crops. 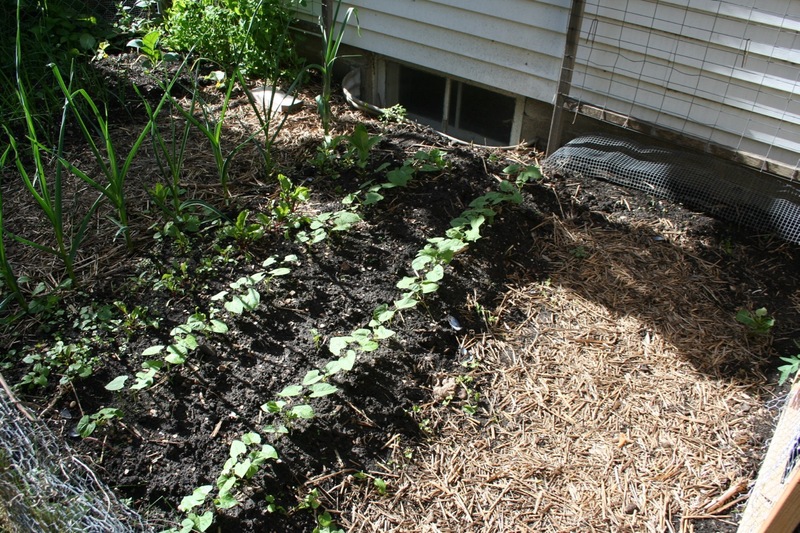 They weren’t quite, but very close, so I just put the soil amendments and plants around my rows of radishes. 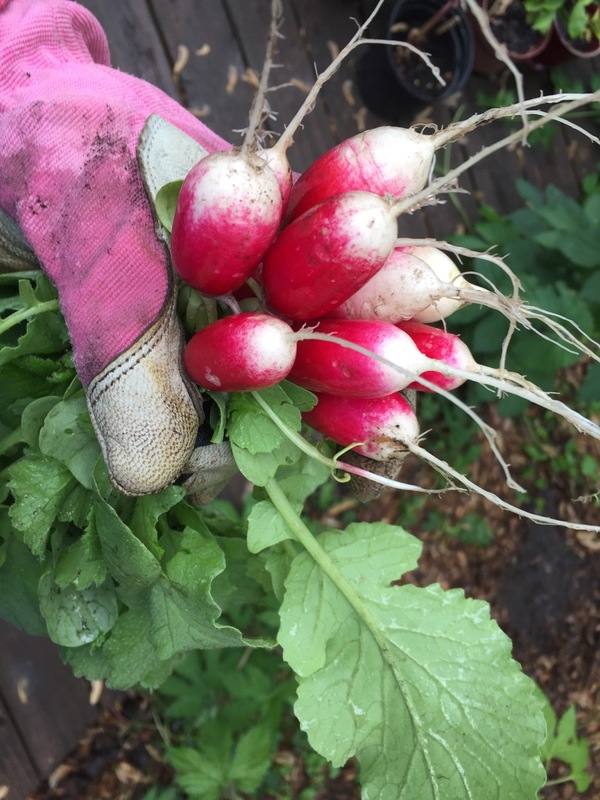 We’ve harvested nearly all of them now, and I’m calling this radish year a success. Some people replant radishes every two weeks and harvest all summer. 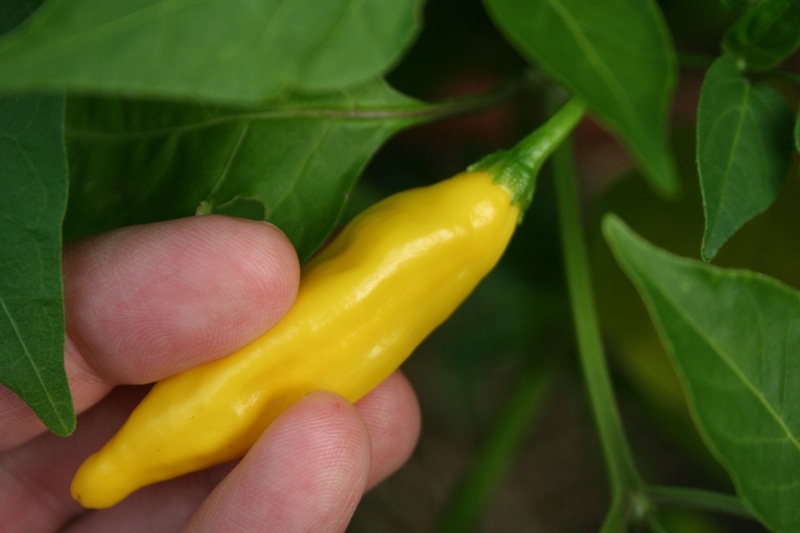 Growing them in the heat of summer has never worked for my particular microclimate. You have to keep experimenting until you hit on the right timing and right soil amendments for your situation. 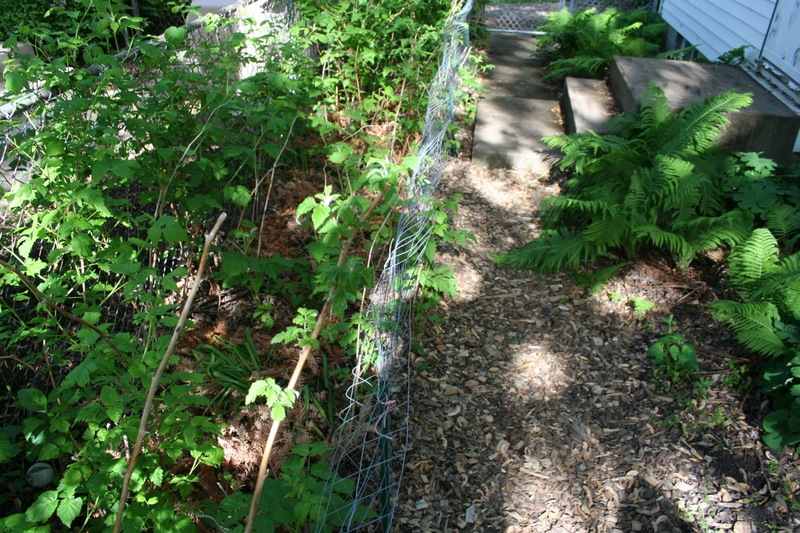 More solutions to our particular problems: pictured here is a new squirrel-proof tomato fortress that we are building. It’s nearly done, just needs a little more chicken wire. It has a door on each side so that I can reach in and harvest. 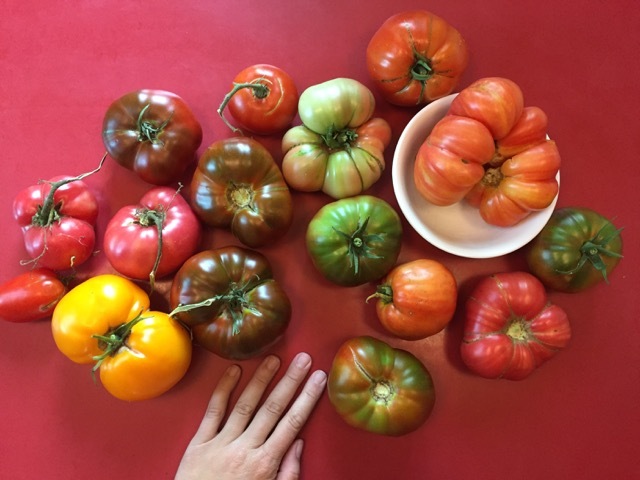 In celebration of this, I’m growing lots of big tomatoes this year—no cherry tomatoes, which I’ve grown in the past in hopes of sacrificing some to the beasts. 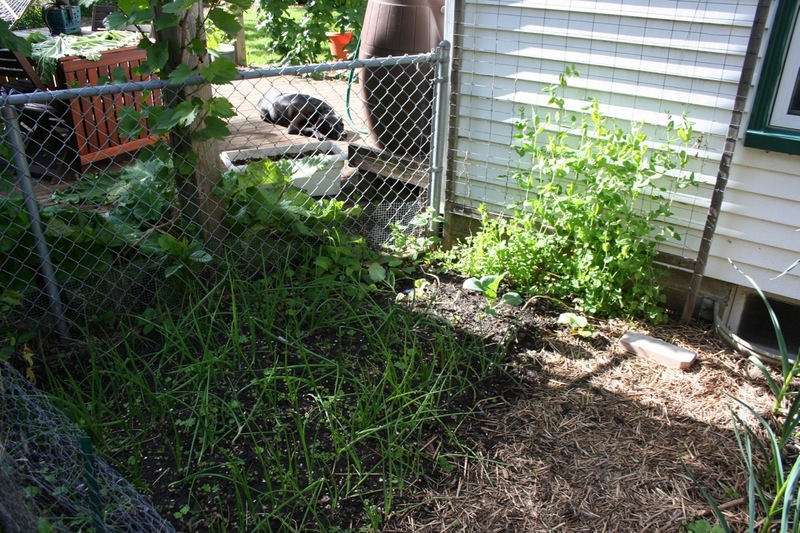 On the trellis to the right, snow peas are doing quite well (no blossoms yet). Left to right, garlic, poorly-sprouted beets, and well-sprouted haricot vert green beans. 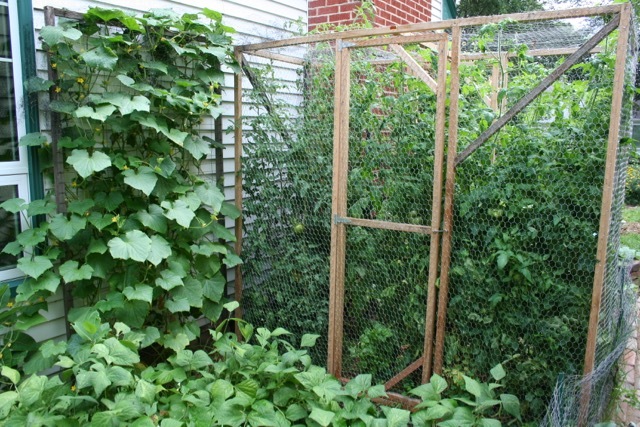 Under the cage/trellis: cucumber seeds not yet sprouted. I had a beautiful line of cucumber seedlings and a squirrel ate all of them. I had to replant. 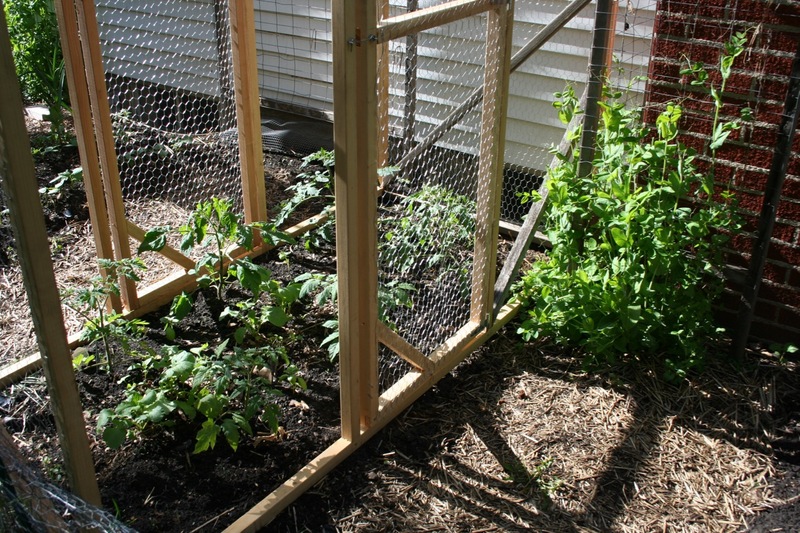 Some day I would like to build a squirrel proof GARDEN enclosure, not just one for tomatoes. On the west end of the garden, some nice rows of onions, and between them rows of parsnips, which also sprouted nicely. I soaked my parsnip seed this year, and I also planted them very early—we had a very rainy April so I think that was a good strategy as well. They can be finicky to sprout and this was the most successful I’ve ever been. 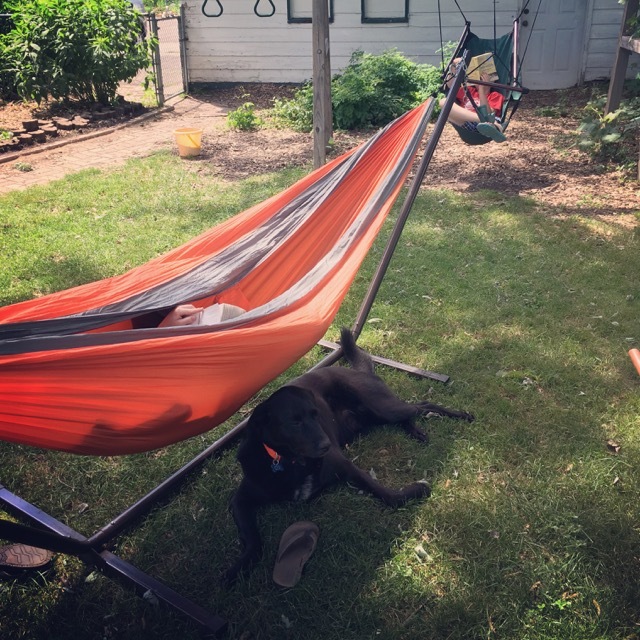 We’ve also got more snow peas and some no-longer-homeless collard greens at the back; finally, a sad dog who wishes he could be right at my side at all times on the deck. 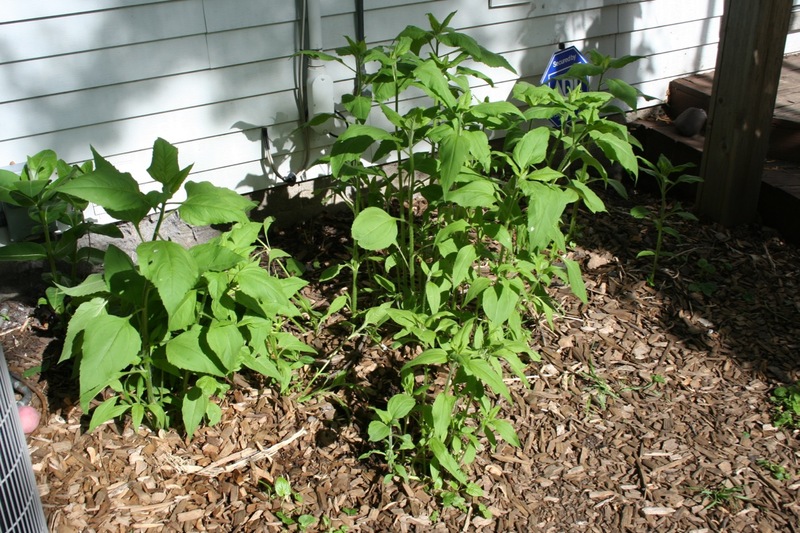 The warnings about planting Jerusalem Artichokes, aka Sunchokes, are apparently not ill-founded. This was three seedlings, last year. 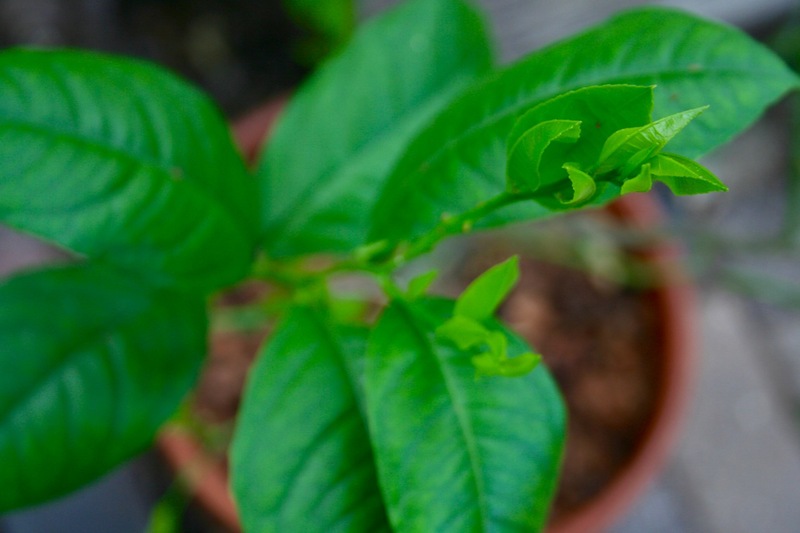 They never looked great, and I thought my experiment was a failure….then they turned into more than 15 seedlings this year. I will be sure to harvest at least half of these this fall so that they don’t get out of control. 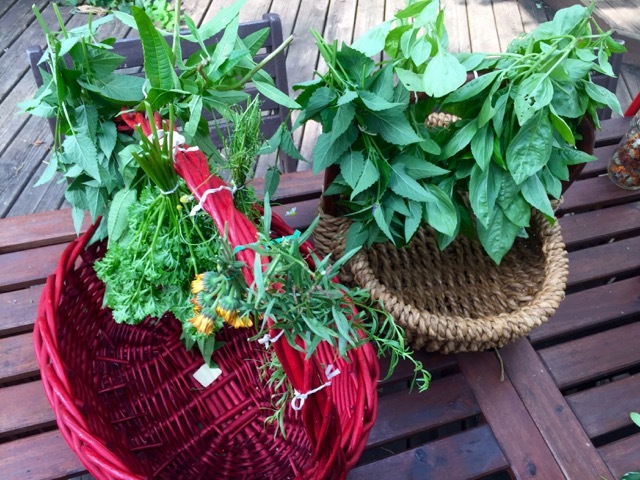 But to get a harvest, really, was the whole point—so I’m pleased. 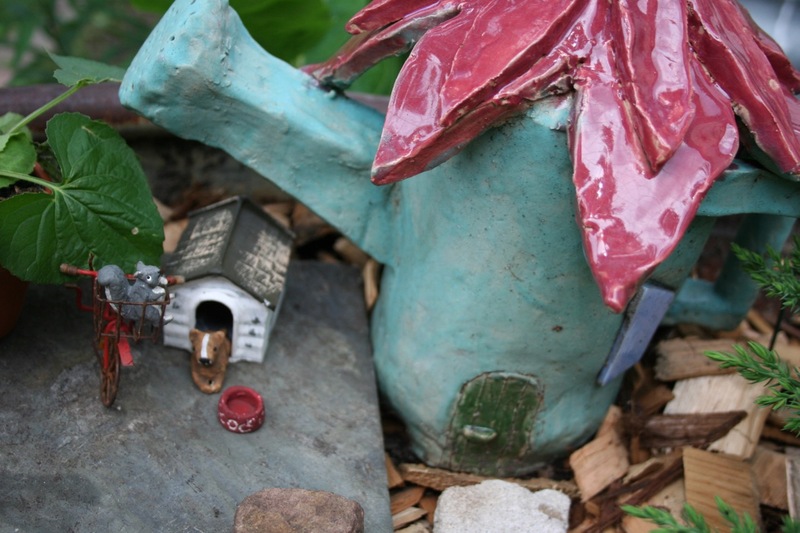 The kids have spent many hours on their fairy gardens already this year. 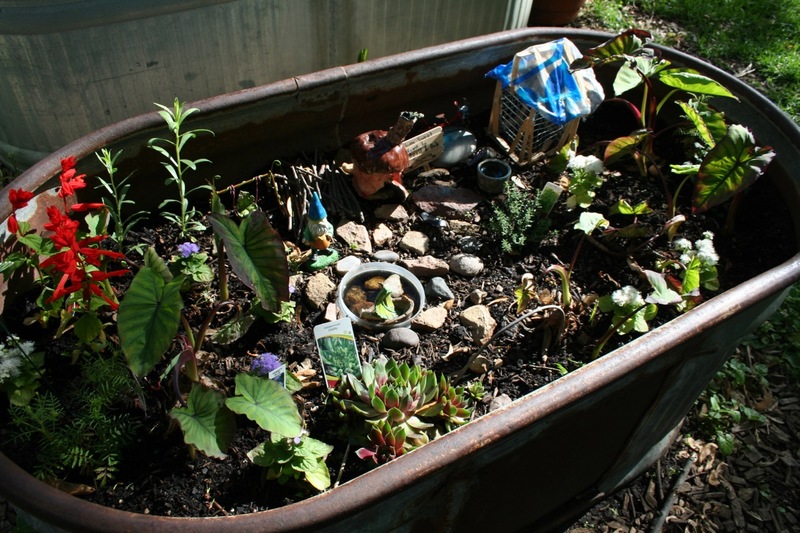 Anneke’s fairy even has a greenhouse (with the blue plastic). When the elephant’s ears get bigger we won’t be able to see much of this, so it’s fun to get a peek now. 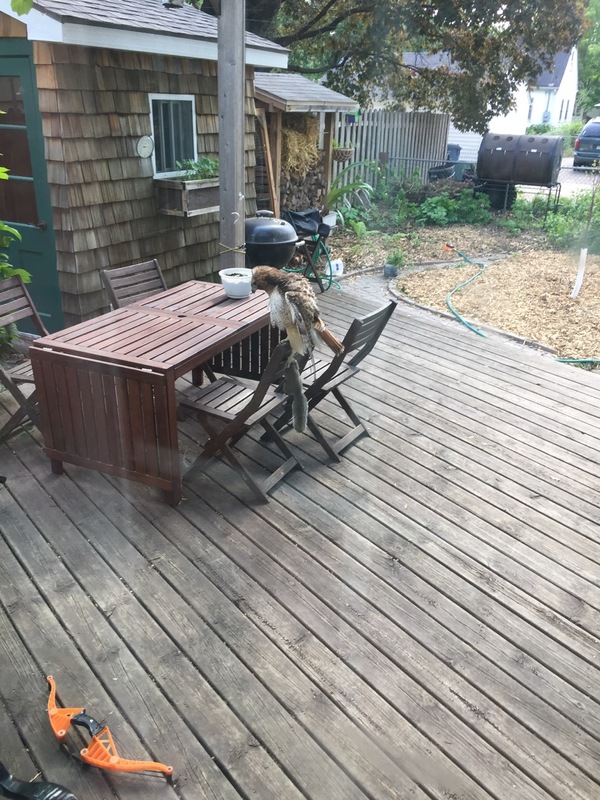 Our resident squirrels drink out of her fairy’s pond every day, while the cat watches from the kitchen window in irritation. 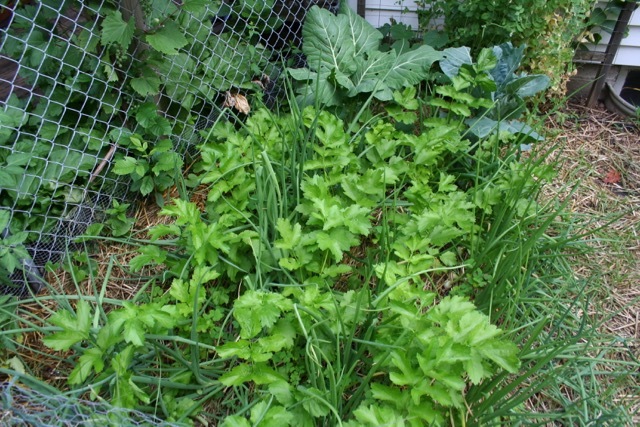 We planted a shady rain garden several years ago, and one of the recommended plants was Virginia Waterleaf. 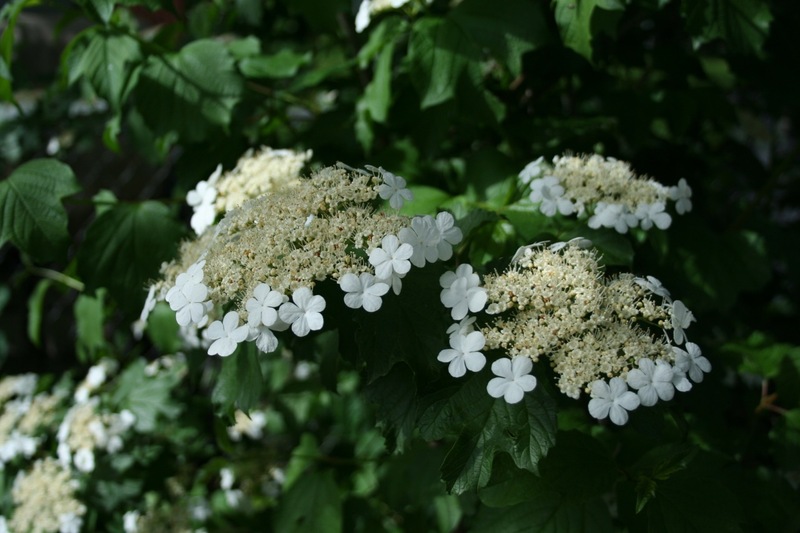 This is not the most popular of native landscaping plants due to its aggressive nature. We started with one or two and now they’re all over our back yard. 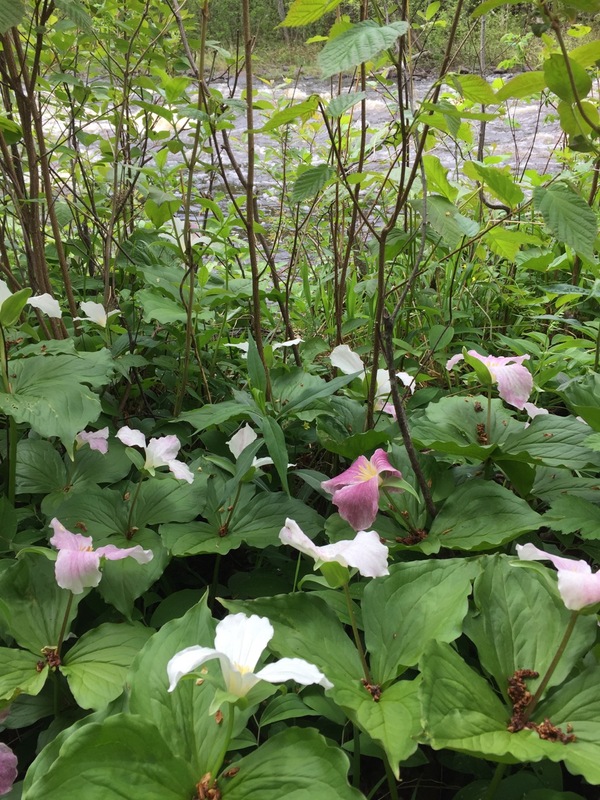 But most of them are growing in places that would otherwise be populated with some noxious weed like garlic mustard, which this is out-competing in a couple places. 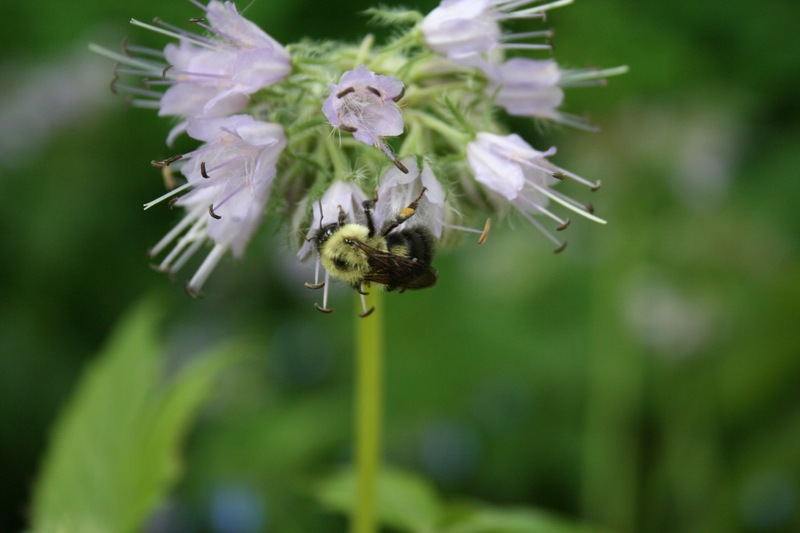 I’d much rather have Virginia Waterleaf—it’s pretty and it helps pollinators. 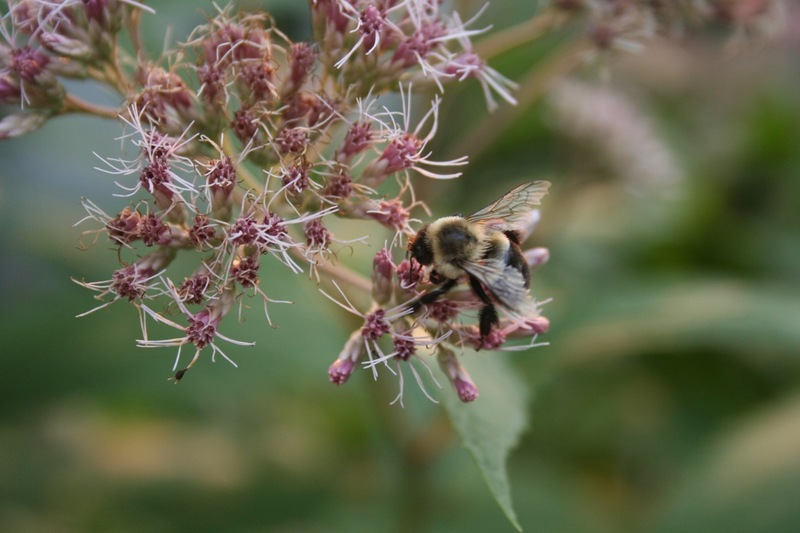 The rain garden was buzzing with bees today, in between rain showers. 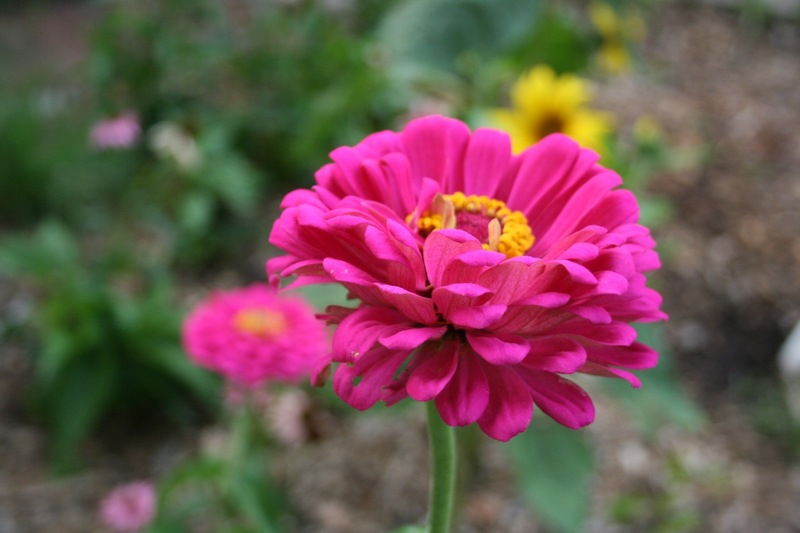 How does your garden grow, this year? 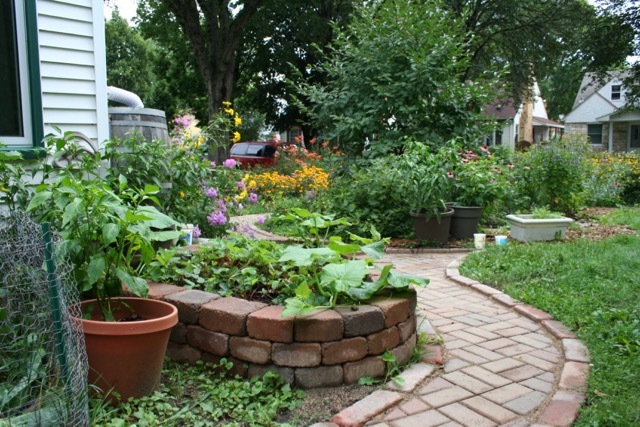 Categories: Gardening, Permaculture, Practical | Tags: beans, edible landscaping, native plants, Permaculture, tomatoes | Permalink. It’s all starting. I planted my snow peas last weekend, but that was about it. 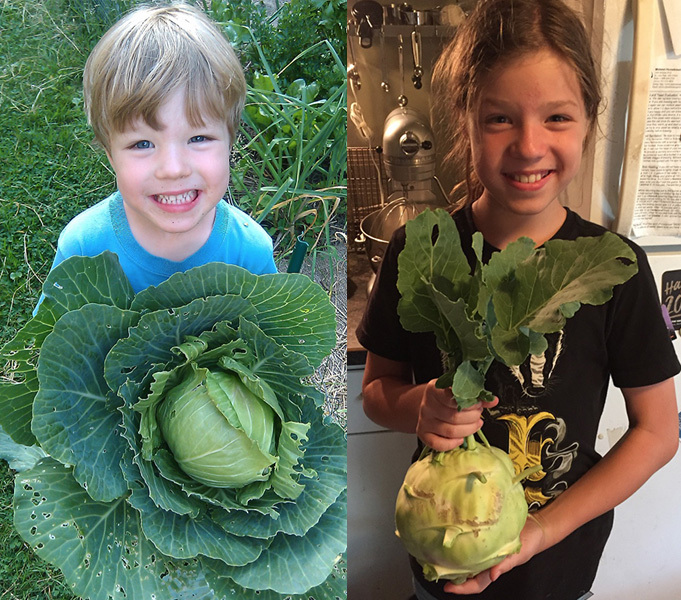 I had to take time off work this week to stay home with my spring break kids, so I accomplished a lot in the garden. 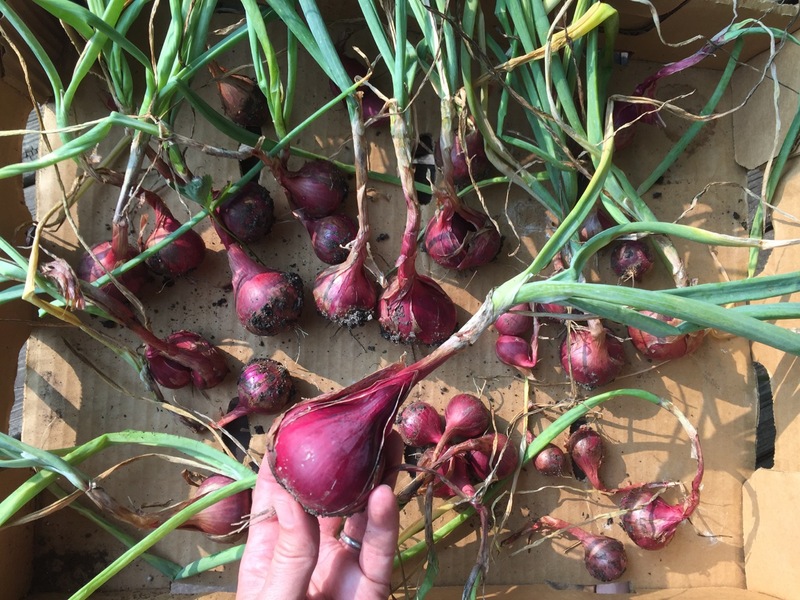 Today, I put in my onion starts—I buy them at Mother Earth Gardens. 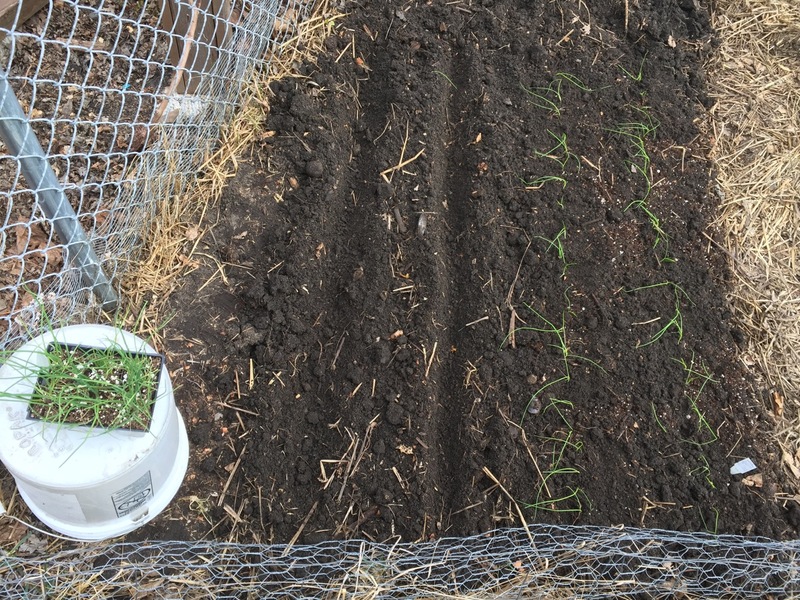 Yes, planting the thread-like baby onions is a little tedious, but on a glorious partly-cloudy 60 degree morning, well, I guess it depends on your level of tolerance. I was just happy to be out planting and it was soon done. I also planted some radishes—they weren’t part of my garden plan for this year because for the last several years they’ve performed so dismally for me. But I was staring at the garden on Thursday (true story), and I realized that I have a month (at least) before I could plant tomatoes. Radishes are supposed to take around 30 days, so I decided to try them once again, but this time at least two weeks earlier than I’ve ever planted them before. They like cool, rainy weather, so fingers crossed that this time I’ll see radish success. I planted them precisely where I plan to plant tomatoes. Will this work? We’ll see. Anneke and I also attempted some propagation this past month or two. 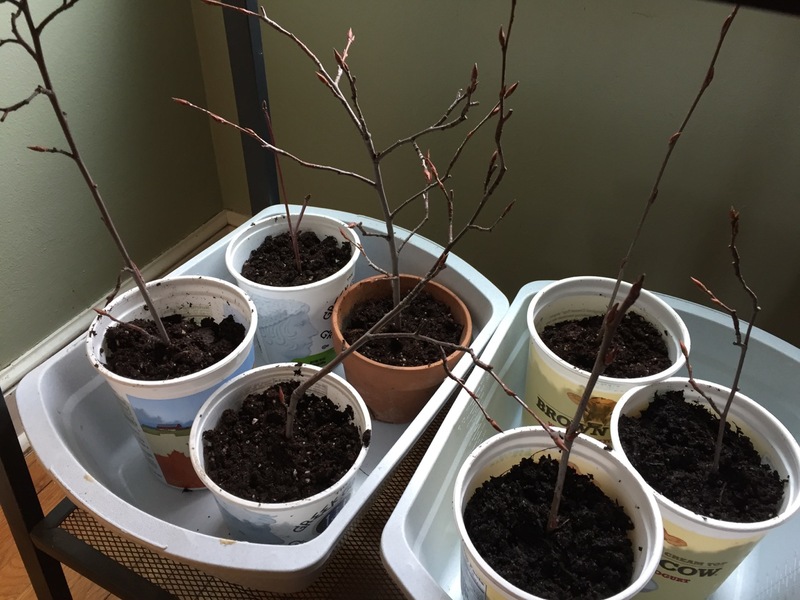 Here are several branches I trimmed from our serviceberry. Adam is keen on adding all kinds of native shrubs to his family’s hunting land, for deer, turkeys, and other game animals to munch on. 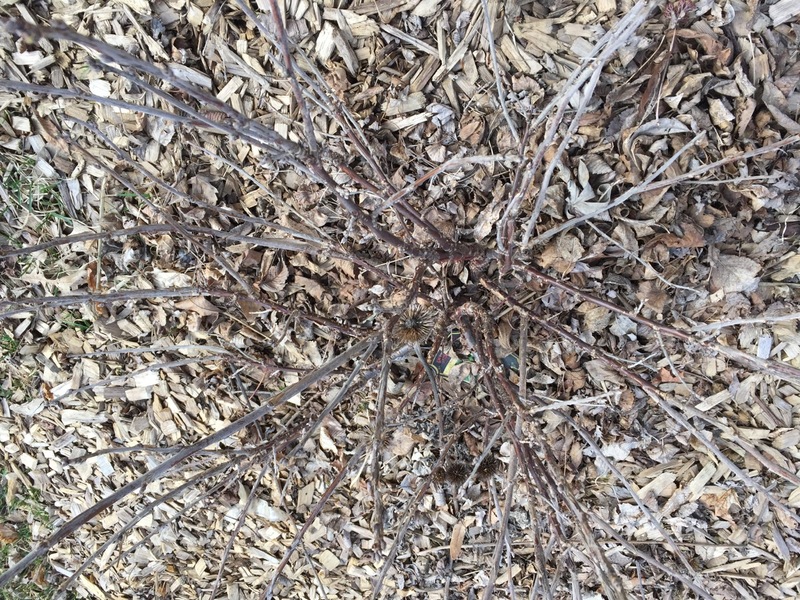 After starting this experiment, however, I read that in order to propagate shrubs like this you need to trim off an actual sucker with roots, not just a branch. 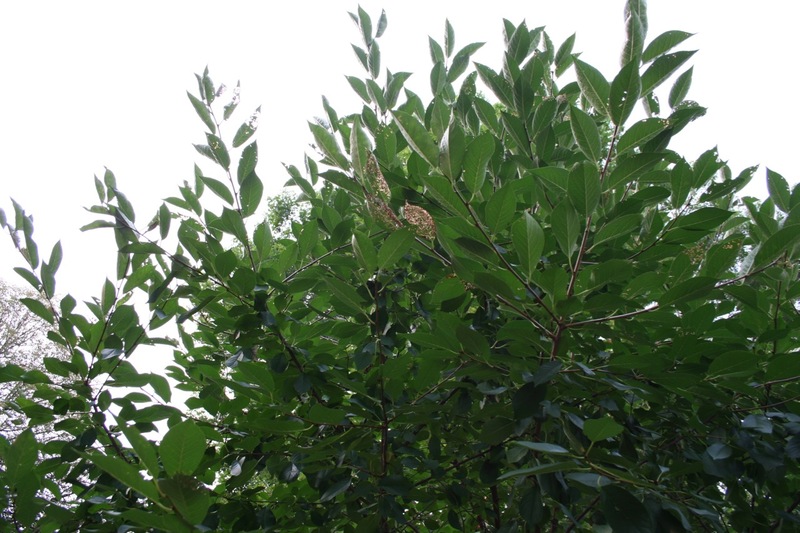 More details on propagating serviceberries can be found here. I’m going to try starting some from seed this summer! So even though this was a fail, we learned and we are now attempting to propagate one sucker that I was able to find. In other disappointing news, our Sabathani community garden is in trouble. 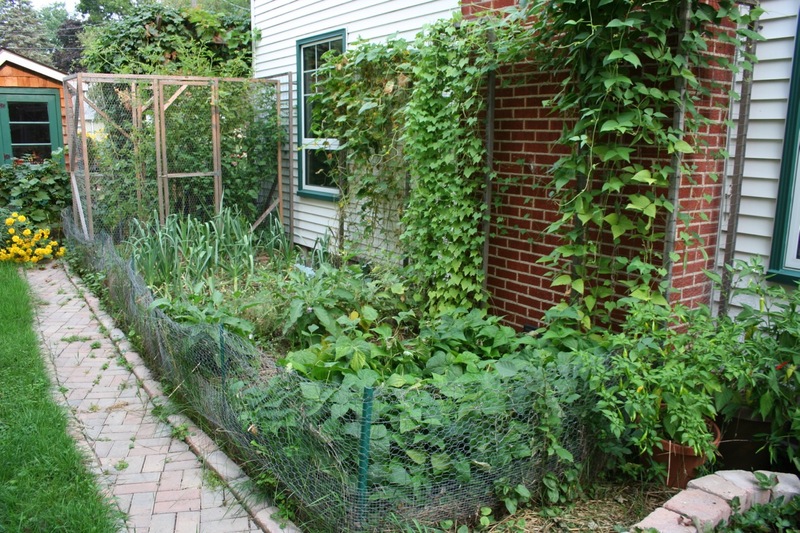 Plans to build a new senior housing complex right next to it mean that, best-case scenario, our garden will be closed for an entire year starting this fall and re-opening in spring 2019. Worst-case scenario, the space will only be available on a very limited basis to residents of that complex. Everything is very much in flux right now and I won’t be able to move forward with my food forest idea for at least a couple of years, if ever. Maybe that’s OK though. I do take on more than I ought. 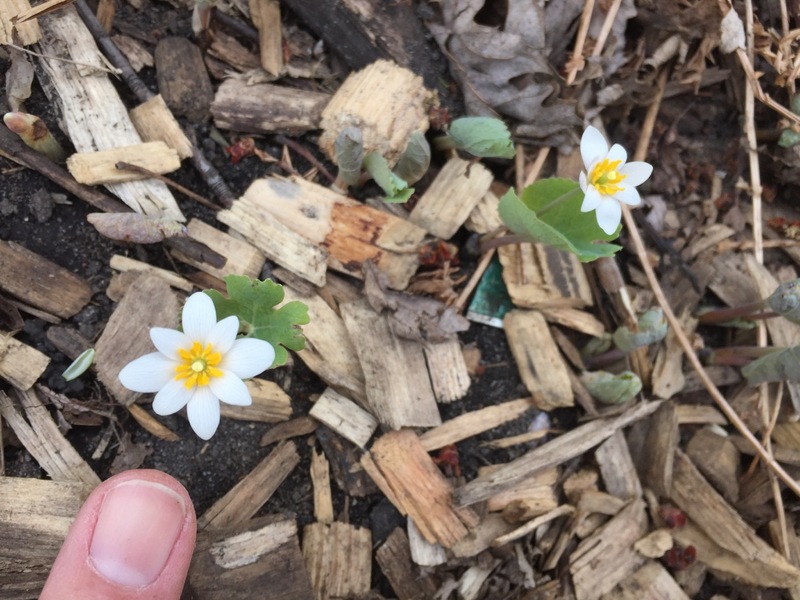 The first bloodroots of 2017 opened up in my yard today. Aren’t they sweet! That’s my thumbnail for size reference. They do sometimes get bigger than this, but not much. I will be interested to see if I can spot any pollinators on them. I’ve seen a couple wasps and quite a few boxelder bugs flying around, but that’s it so far. 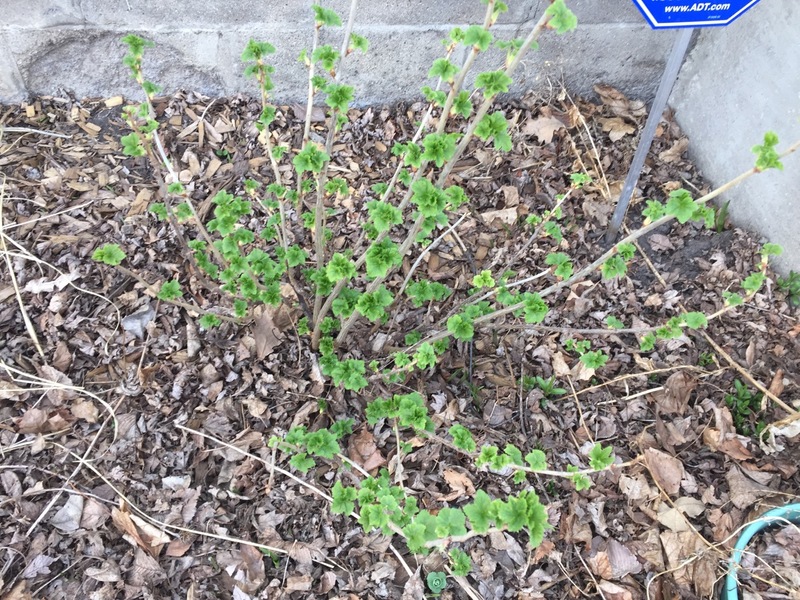 As of today, my Red Lake currant bushes (one of them pictured, top) are barely doing anything while my Ben Sarek black currant bush (pictured, bottom) is almost leafed out. 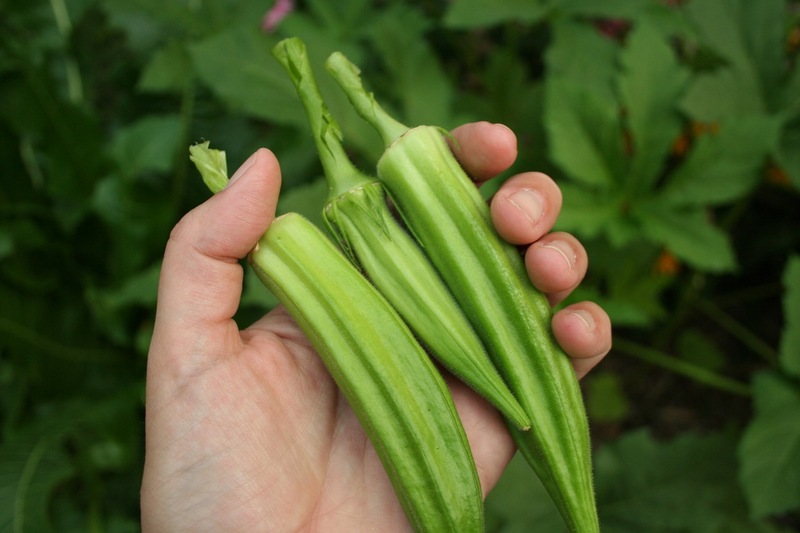 It’s fascinating how different varieties of the same plant will behave. 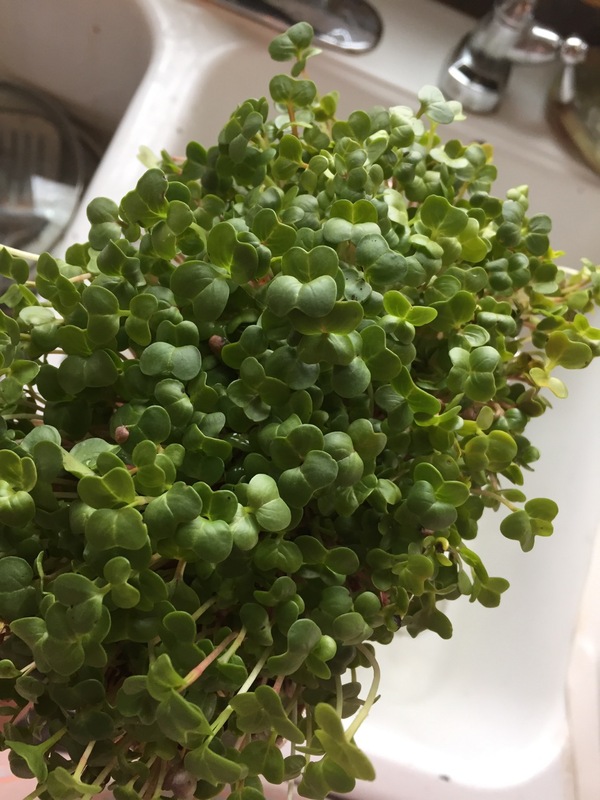 We’ve been eating soil sprouts all winter long, and I really don’t see any reason to stop growing them now that spring is here. 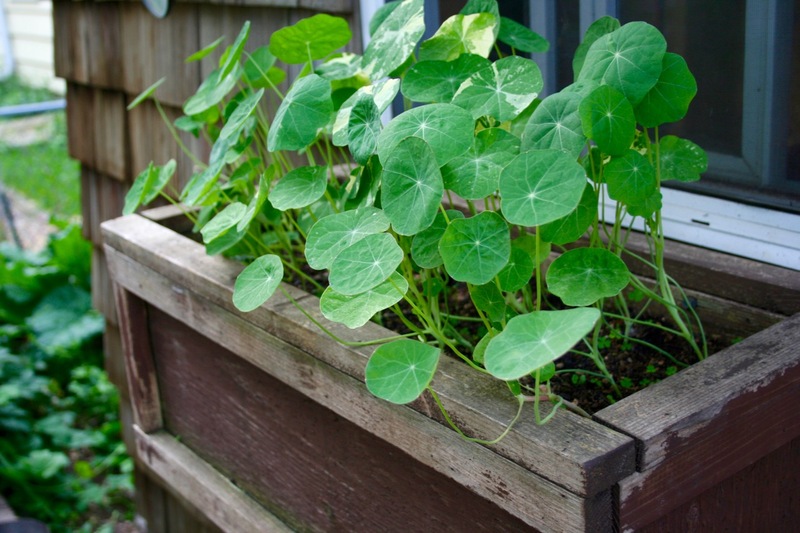 I want to try mixing things up, and growing 5 trays of pea shoots, for example, and stir frying them. I really enjoy doing this and highly recommend the book—Year-Round Indoor Salad Gardening. Pictured are some radish sprouts; we used them as a topping on black bean and sausage soup. 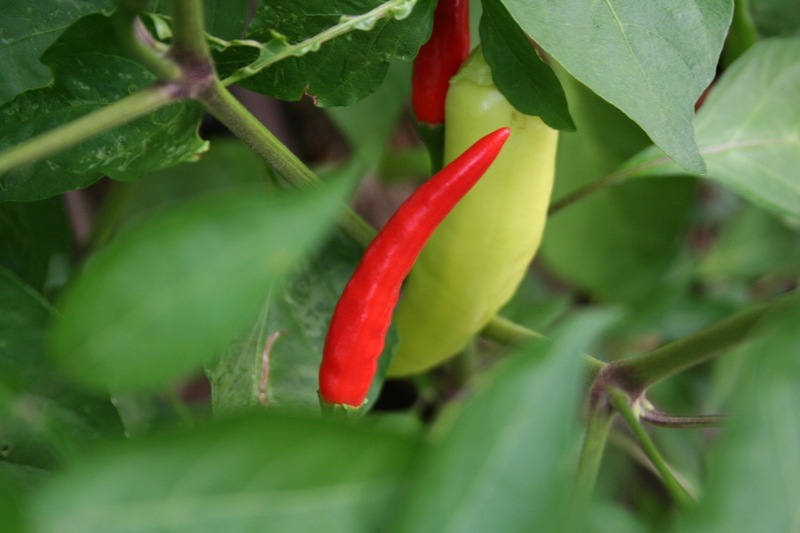 What’s happening in your garden so far? I can’t remember ever getting going as early as I have this year, partially due to having such a mild winter. 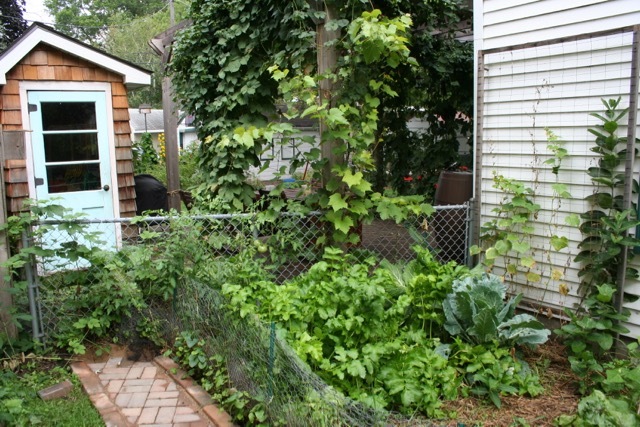 Categories: Gardening, Practical, Sustainability | Tags: landscaping, native plants, radishes, wild game | Permalink.